• 25.12.14 WL100/74: Lutosławski Rules! The commonly accepted score line is Roussel 3, Lutosławski 1. 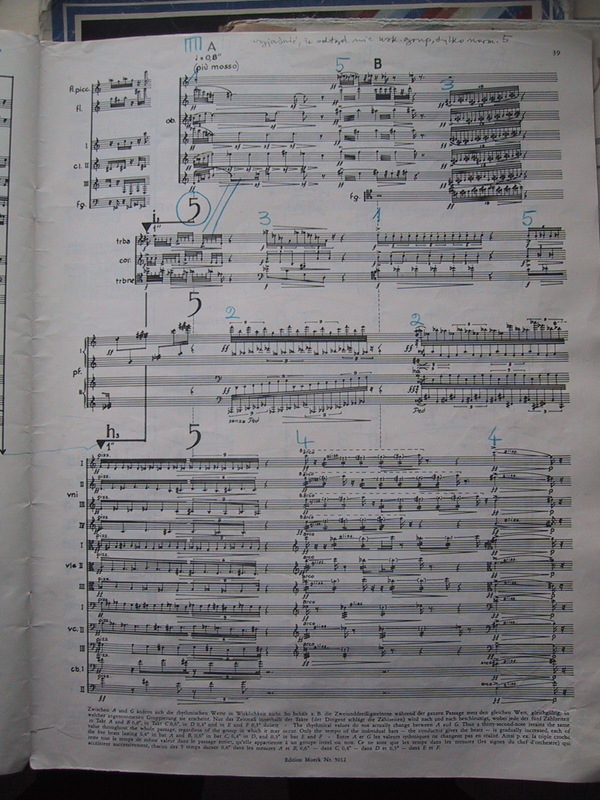 Or, in musical parlance, Roussel’s Third Symphony is usually linked with Lutosławski’s First. Lutosławski himself laid emphasis on the significance of the French composer’s work, especially with regard to symphonic form. 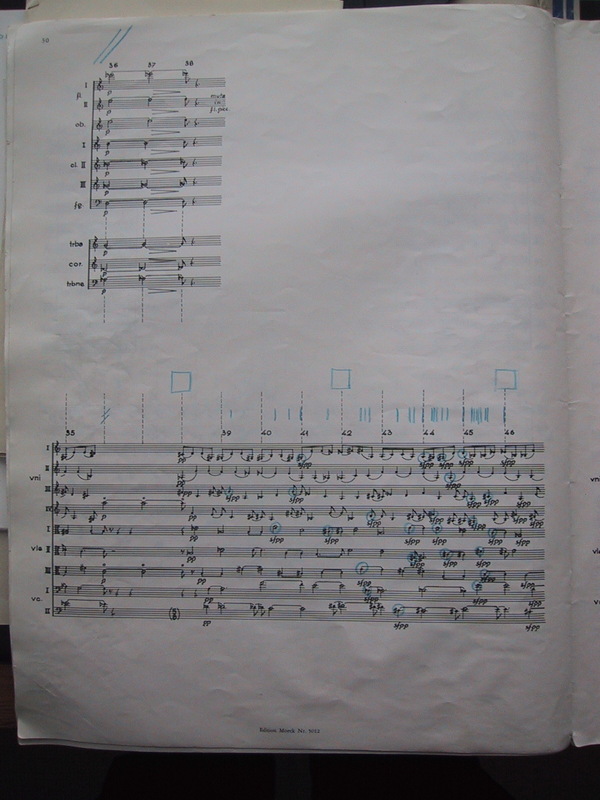 Charles Bodman Rae investigates this relationship more than others when he also finds motivic functional patterns linking the slow movements of the two symphonies. I was reminded of this when I spent three days researching in Lutosławski’s house in late September 2002. 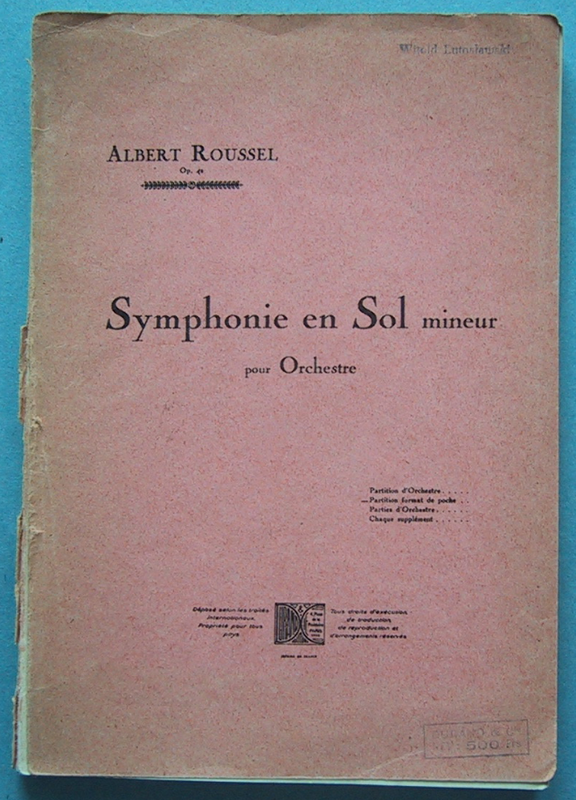 There on his shelves was his score of Roussel’s Third Symphony, which Lutosławski had heard in Warsaw as a teenager at the start of the 1930s. 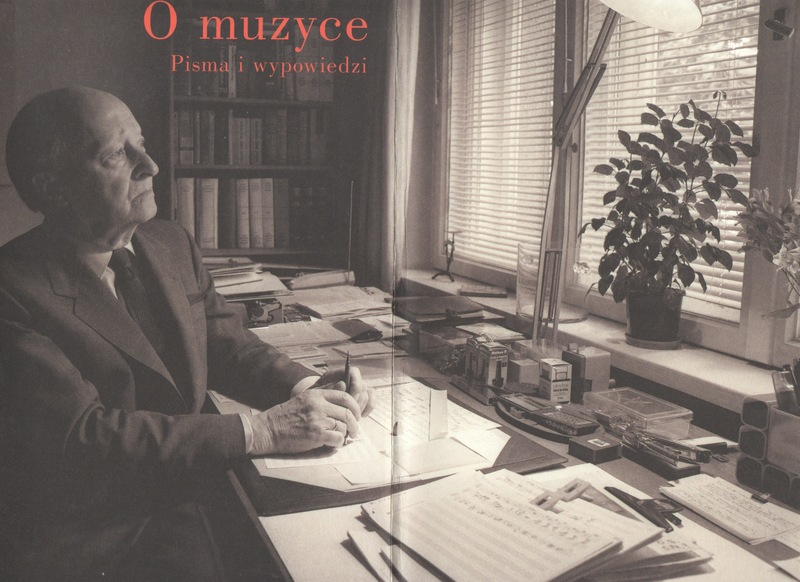 It even had his name stamped on the cover (does the stamp help to date Lutosławski’s purchase of the score?). 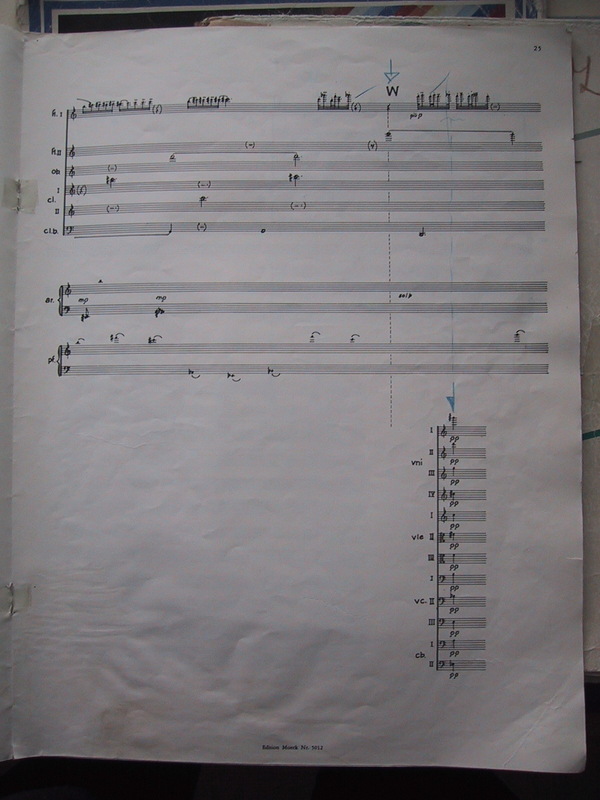 The ‘first’ sheet contains two themes: (i) the first six bars of the first movement, Allegro vivo, and (ii) the opening ten bars of the finale, Allegro con spirito. 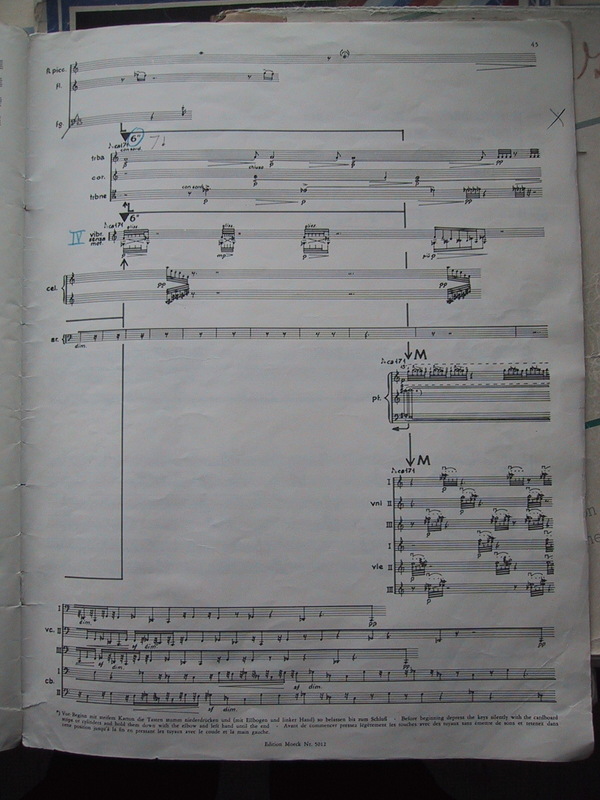 The ‘second’ sheet has just one theme: (iii) the first ten bars of the second movement, Adagio. 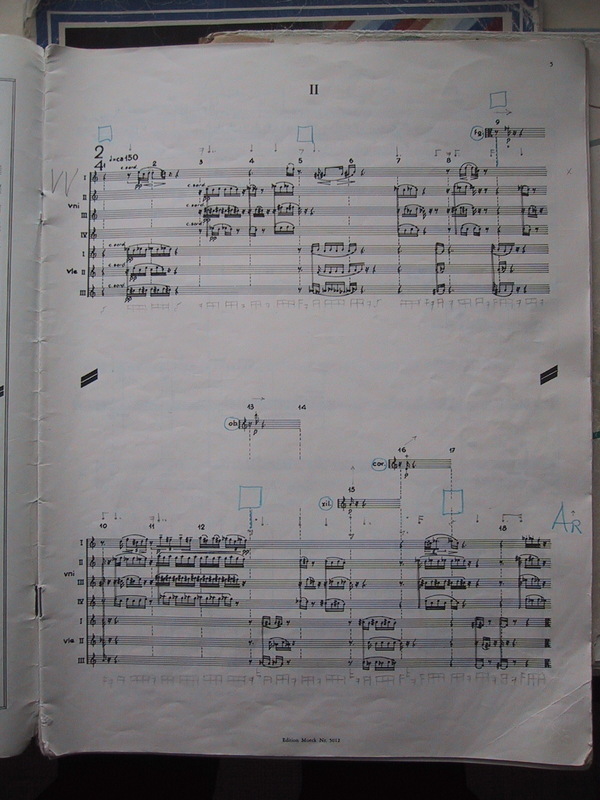 The ‘third’ sheet has two themes, both from the finale: theme (iv) picks up the fifth bar of fig.65 and takes it four bars, while theme (v) jumps to the very end of the movement (excluding the last two bars), starting at fig.80. What struck me most was this ‘last’ sheet. Combined with comments in his Basle talk, it reinforced something that I had perceived long ago and yet which – to the best of my knowledge – no-one has ever pointed out. If correct, it sheds new light on Lutosławski’s relationship with Roussel’s Third Symphony. In the second part of his Basle lecture (the first part covers issues such as the neglect of Roussel’s symphony and the definition of neoclassicism), Lutosławski goes through the key thematic material. 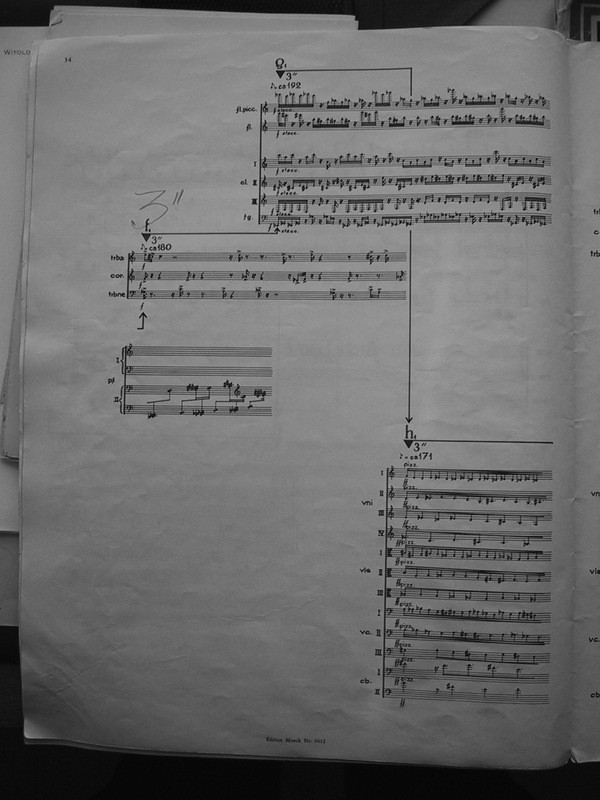 He gives page numbers and contextual musical information, although it is not a thoroughgoing analysis. He does focus, however, on what he calls the ‘motto theme’. This evidently intrigued him. The theme inveigles its way into every movement, sometimes overtly, sometimes indirectly. For example, it is incorporated into the violin line at fig.1, although Lutosławski does not mention this first instance. 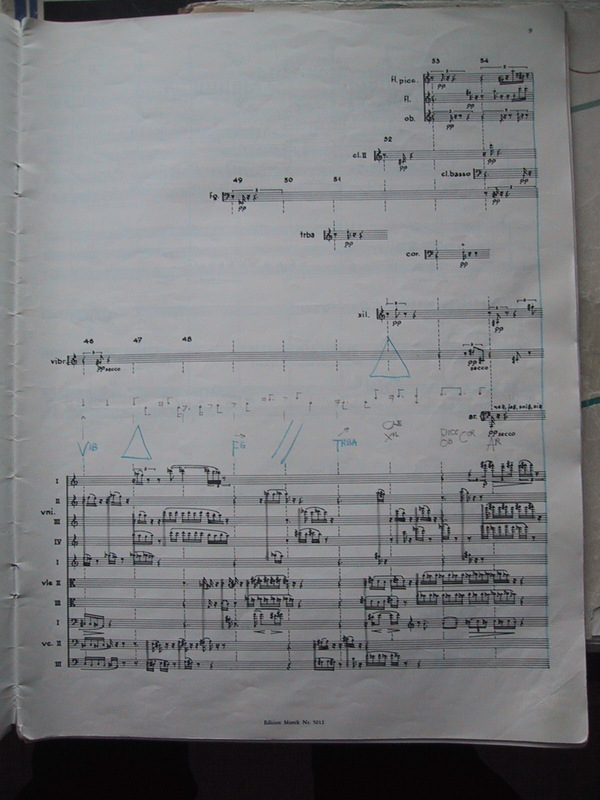 In the first movement, he refers to page 10, where the flute figure embraces the theme (here it is on its recapitulation, on violins, six bars after fig.17, on p.30). More obviously, the motto theme thunders out on page 27 (four bars before fig.16). 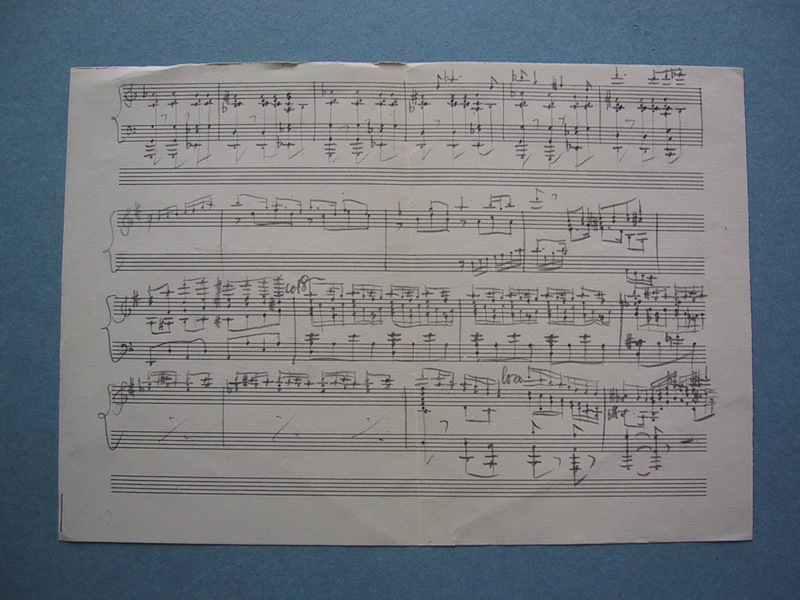 Lutoslawski begins his observations on the Adagio with the motto theme – see manuscript above, theme (iii). 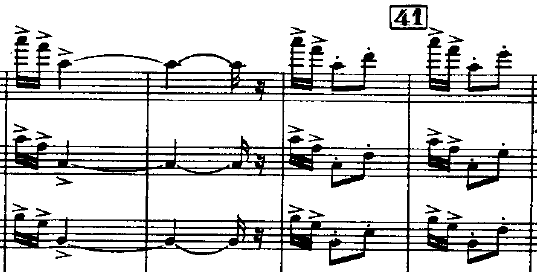 He then cites the semiquaver fugato four bars after fig.31 (p.50) as beginning with the first five notes of theme, ignoring the fact that it is prefaced by a slow version in the first violins. He reserves special delight for the end of the second movement. 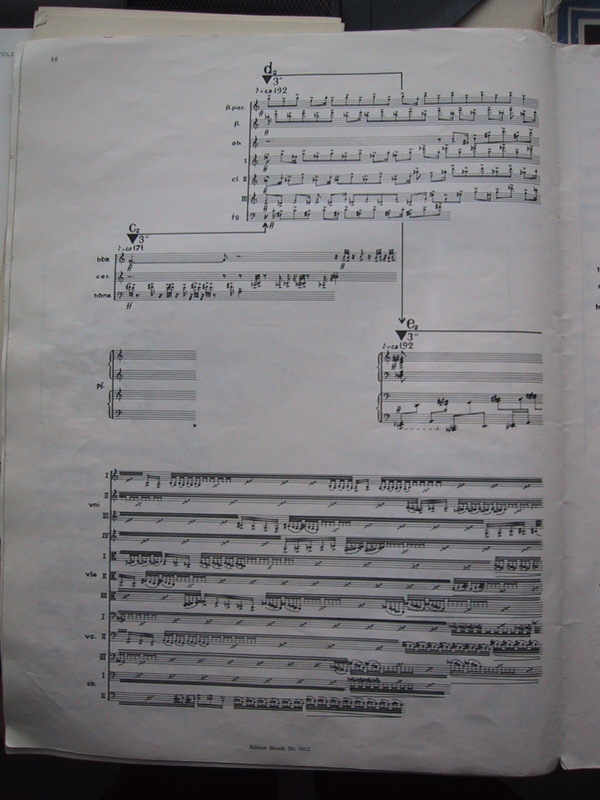 He is captivated by the motto theme’s triple appearance, starting six bars after fig.38. 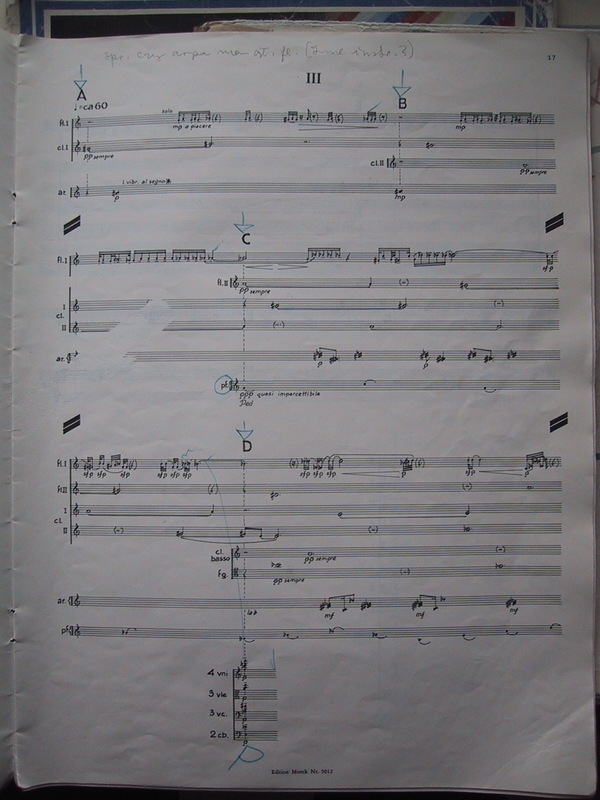 On pages 66-67, marked again Adagio, the theme is played in succession by solo flute, solo horn and solo violin. Lutosławski comments: ‘These three entrances represent for me a particular, rare beauty’. This is the flute entry. 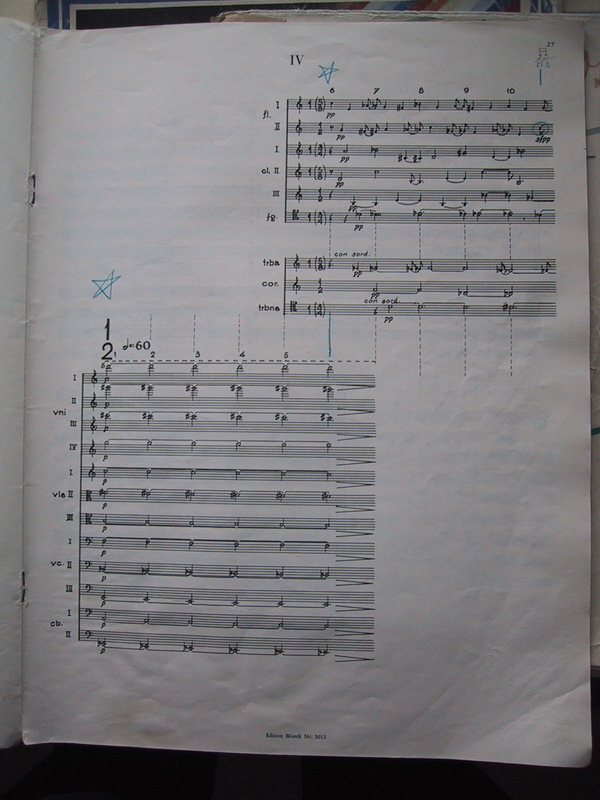 When it comes to the third movement, Vivace, Lutosławski makes no explicit reference to the motto theme, although it is embedded in what he labels a ‘call to attention’ for the main theme that follows a bar after fig.41 (p.70). 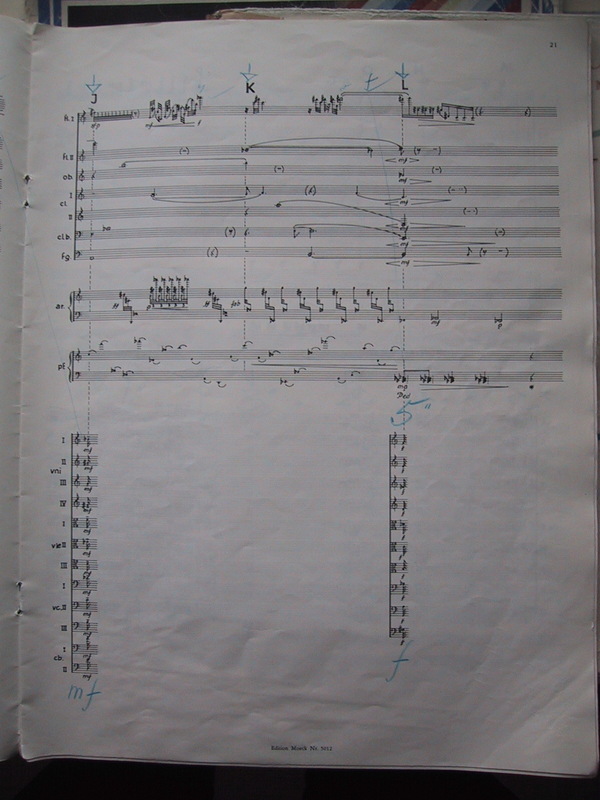 For the finale, Lutosławski first cites the main theme – (ii) above – and then a violin phrase ‘worthy of attention’ – (iv) above. 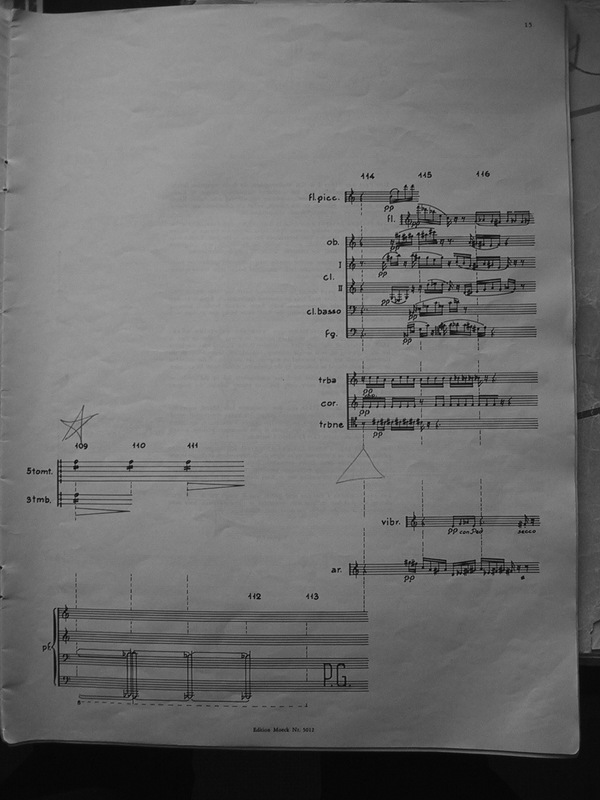 He highlights the motto theme at fig.71 (p.119) that comes just before the recapitulation: ‘This time it is played by the solo violin against a background of harmonies that are both simple and sophisticated, and it constitutes one of the most beautiful moments in the whole work’. This is the start of a section that lasts for almost twenty bars. 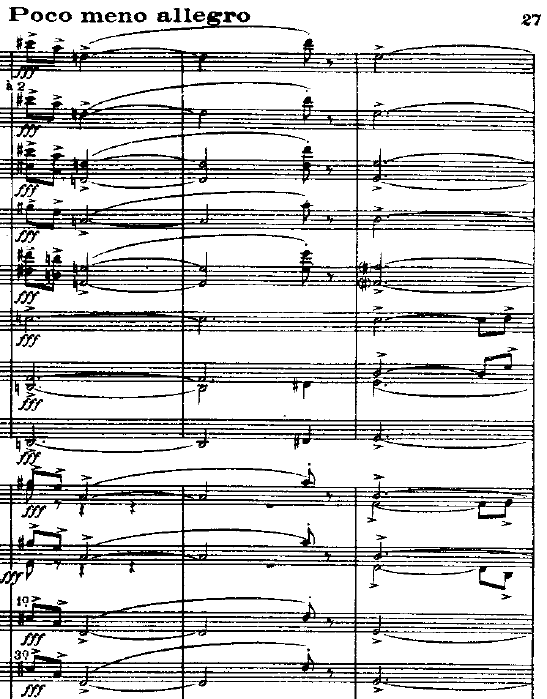 Finally, Lutosławski comes to the peroration that crowns Roussel’s Third Symphony – theme (v) above: ‘The recapitulation ends with the motto theme; this time in a solemn version, but free of any pomposity. It is a gorgeous completion of this extraordinary work’. 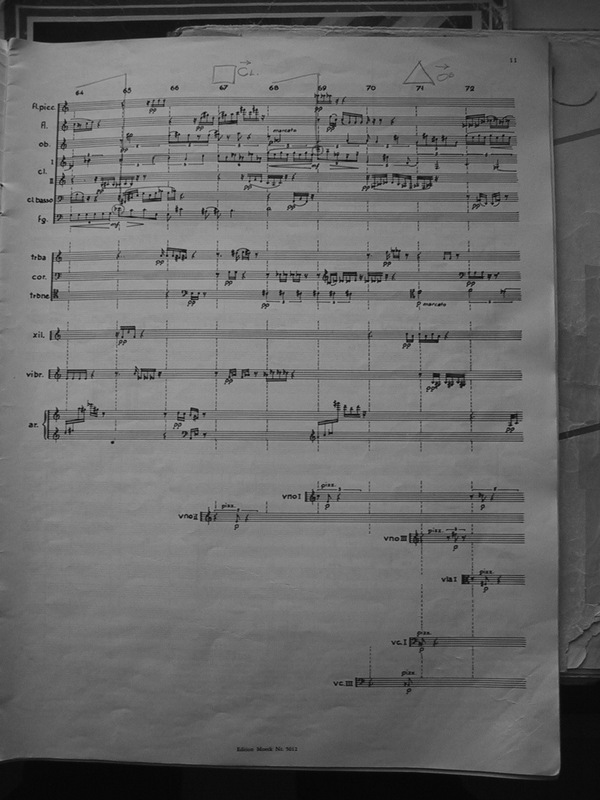 It is obvious from this text that Lutosławski’s enthusiasm for Roussel’s symphony was undiminished, from the Polish premiere at the start of the 1930s to his Basle lecture 40 years later and beyond, as when he spoke with Charles Bodman Rae in 1988 (see The Music of Lutosławski, p.28, fn.9). In fact, his enthusiasm was not unconditional, as his Basle lecture reveals. Nevertheless, it was ‘in his bones’, it was part of his musical life-history. So one should not be surprised that its influence resurfaced more than 30 years after the First Symphony. 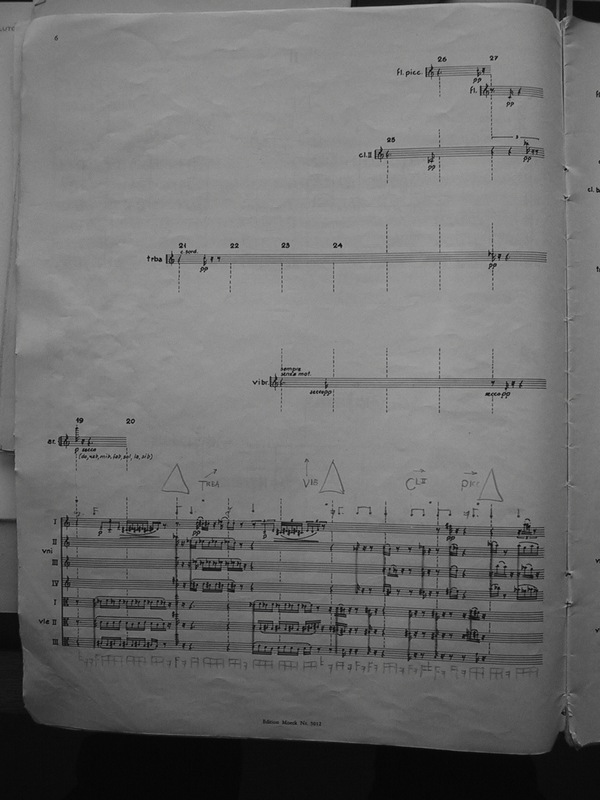 In addition to ‘Roussel 3, Lutosławski 1’ we may surely add ‘Roussel 3, Lutosławski 3’. The reason is staring us in the face, although it appears to have passed unnoticed. I would be extremely keen to hear if anyone has written about this already. Let me cut to the chase by recalling Lutosławski’s admiring phrase: ‘What an inventiveness in the field of melody!’. 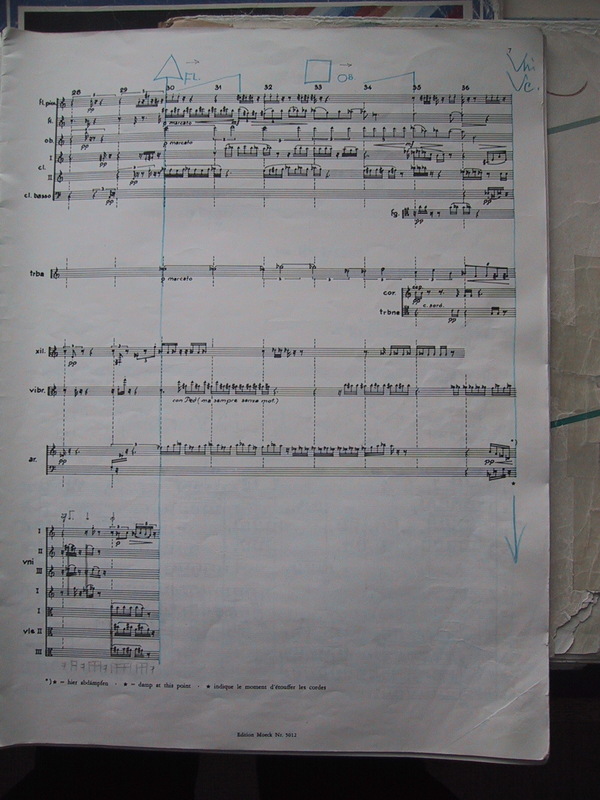 Compare the various versions of the motto theme in Roussel’s Third Symphony with the climactic melody in Lutosławski’s Third. They share a descending succession of two intervals – variously minor 3rd/major 3rd followed by perfect 5th/minor 6th or major 6th. They then rise, almost or exactly, to where they started (usually octave/minor 7th in Roussel, minor 7th or major 7th in Lutosławski). The main anapaestic rhythmic kernel is the same in both. 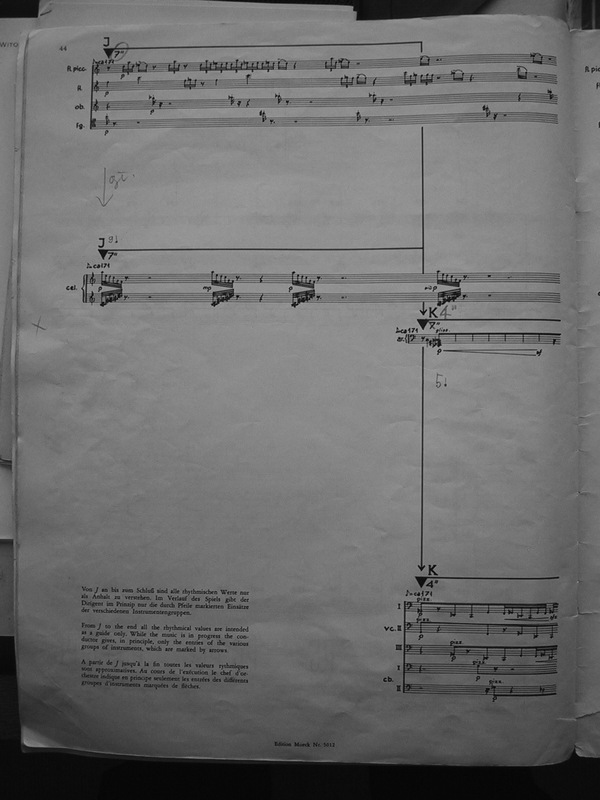 The principal difference lies in the conclusion of the motif, where Roussel, strange as it may seem, sounds more dissonant (it is because of the way in which he comes to rest not on the lowest pedal note, as Lutosławski does, but on the step above). 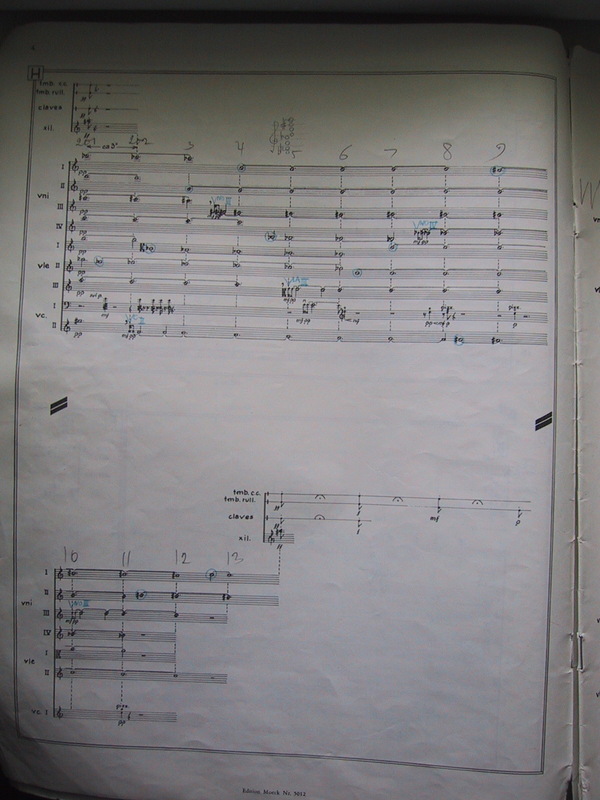 In the Lutosławski, the motivic seeds have been sown earlier, such as in the opening flute ‘bundle’, in the first trumpet at fig.63 and the violins five bars later. Before fig.81, the descending minor third resurfaces in the first violins. 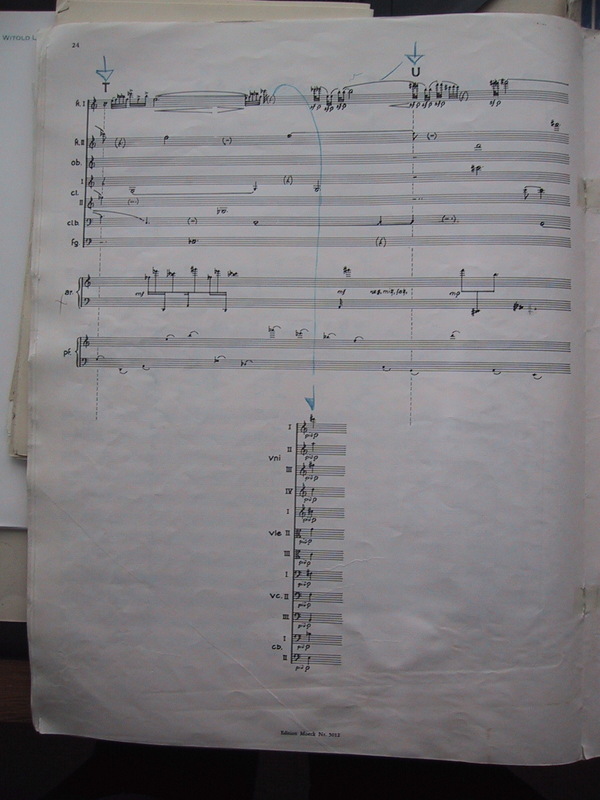 But the first overt appearance of the ‘motto theme’ is in the first violins at fig.84. 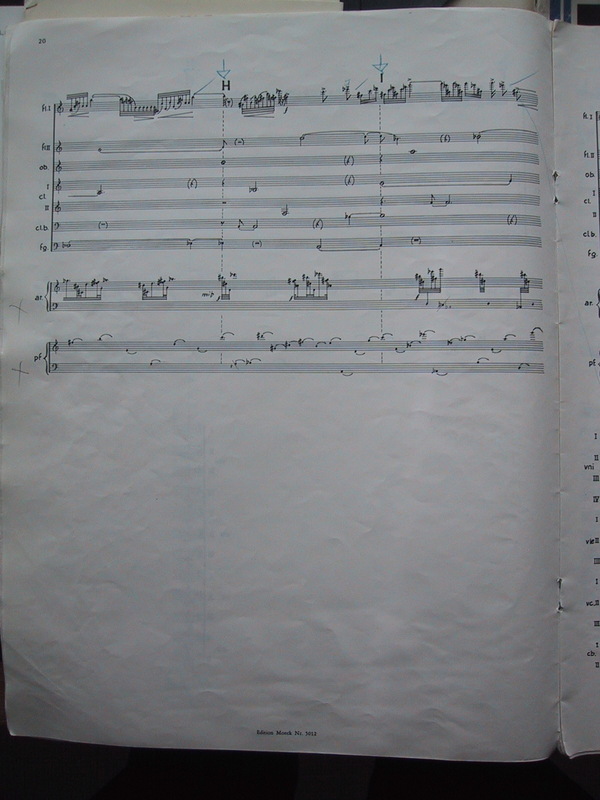 In a manner parallel to the final statement of the motto theme in Roussel’s Third Symphony, Lutosławski gives his equivalent a climactic sweep at fig.97, just before the canonic coda. I am not suggesting that Lutosławski was consciously referencing Roussel. He may have been doing so, or he may have realised the connection later, or he may have been totally unconscious of his tribute. The parallels are certainly uncanny, and I cannot now hear the concluding melody of his Third Symphony without recalling Roussel’s Third too. When the BBC Radio 3 Music Matters team was preparing for its profile of Lutosławski to mark the centenary of his birth (broadcast on 19 January 2013), its web page included several archive photos of the composer plus one taken on location by his stepson, Marcin Bogusławski. 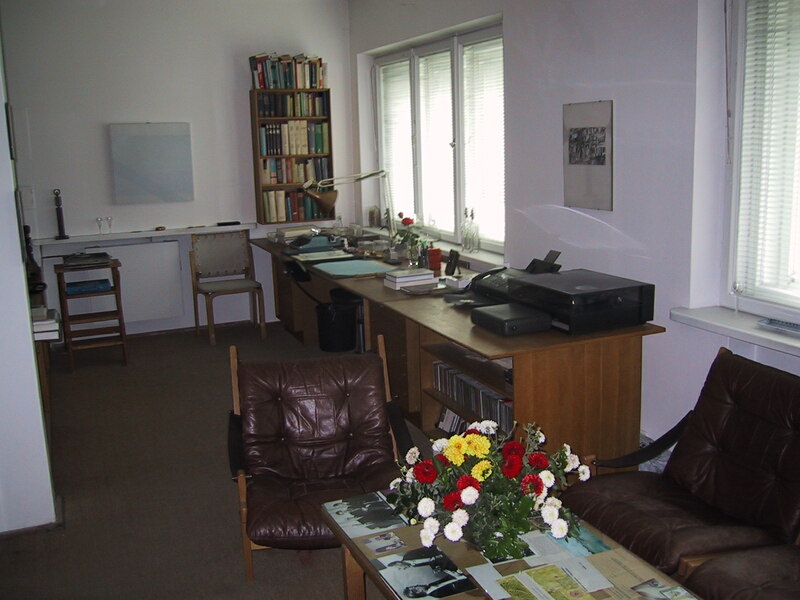 This photo was of his studio, with his desk and bookshelves. 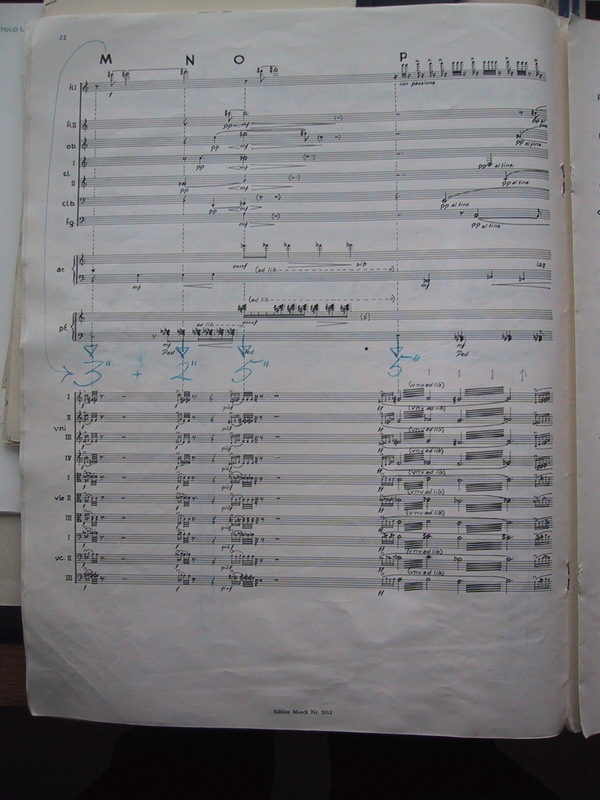 and with the undated one taken much earlier by Malcolm Crowthers with Lutosławski at his desk. It was used for the front cover and inside flap of O muzyce. 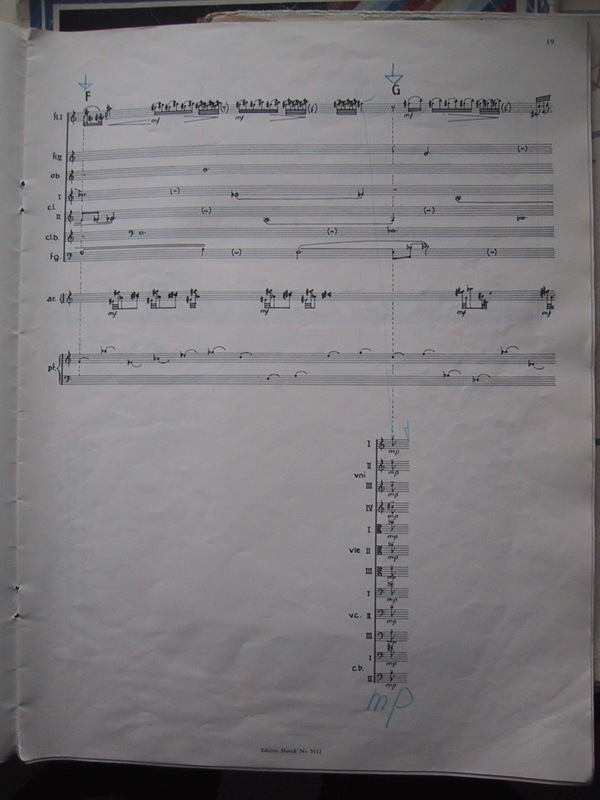 Pisma i wypowiedzi (Gdańsk, 2011), the Polish version of Lutosławski on Music (Plymouth, 2007). Crowthers’ photo is self-evidently the earliest of the three, with Lutosławski gazing out of the window from his desk, which is much fuller of materials than when I took my shot. 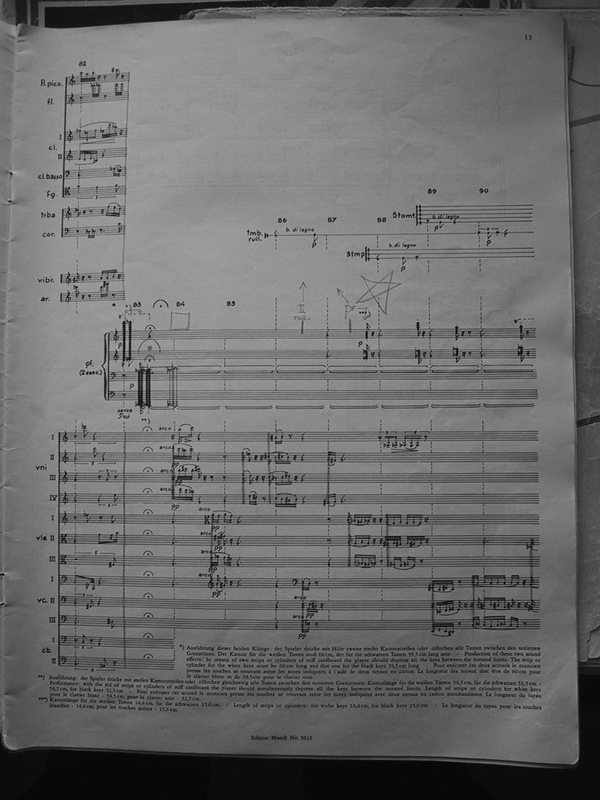 (See also my photos in WL100/72: Lutosławski’s Desk and WL100/74: Lutosławski Rules!.) Bogusławski’s photo has many, but by no means all, of the same books on the shelves, often in a different order. 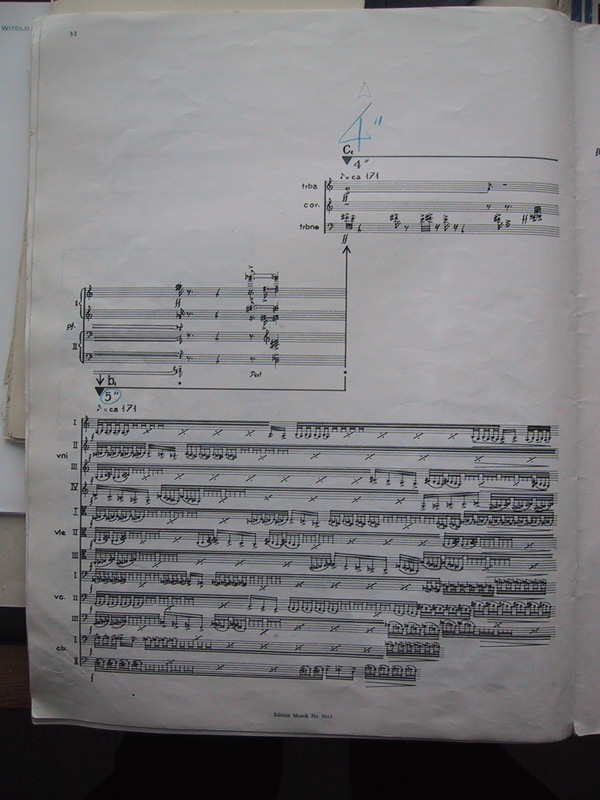 It also has the accoutrements of modern technology, in which Lutosławski had no interest: a computer and printer. 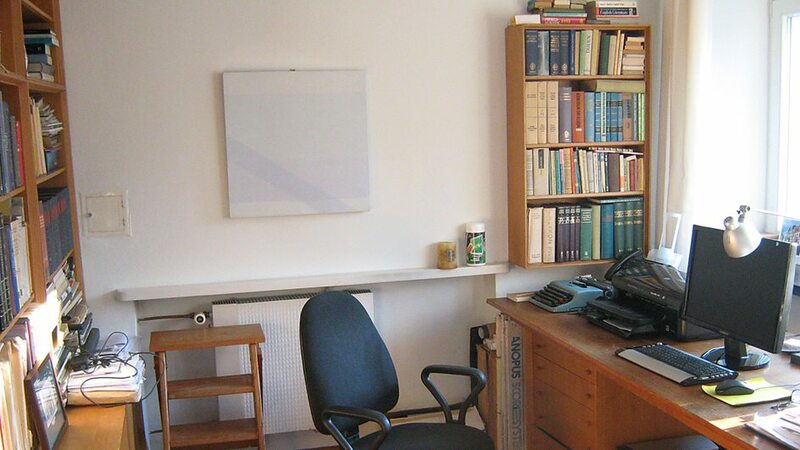 His typewriter is still there, as are the painting on the end wall and the wooden library steps underneath. There is, however, a noticeably new office chair. 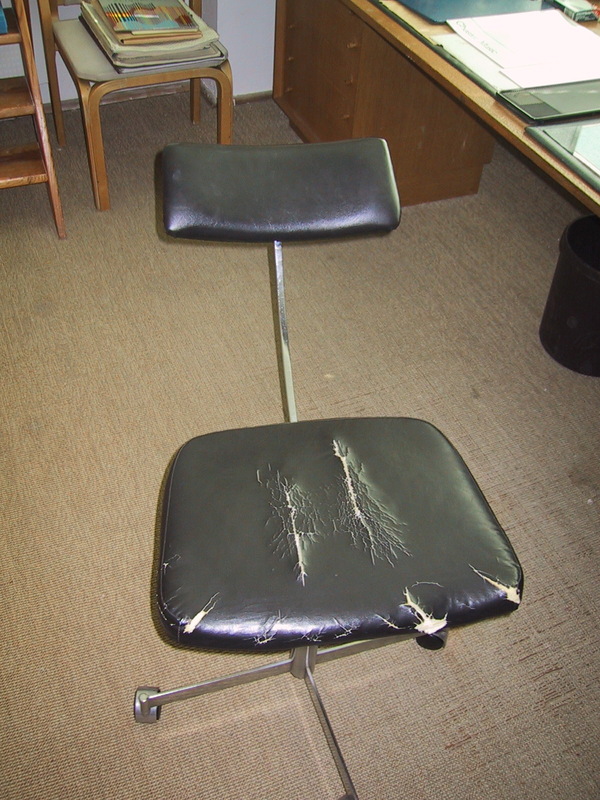 I cannot tell from Crowthers’ photo what Lutosławski was sitting on, but I would hazard a strong guess that it was the office chair that was still tucked into the desk in 2002. Sadly, it was in a parlous state by then. The padded seat was in a bad way and the adjustable back had lost its upright position and leaned impossibly towards the floor. It was something deeply melancholic to see it in this state of disrepair, its occupant long absent. It was a reminder of how much Lutosławski had written from this chair and how much he was missed. Incidentally, on the seat in the background of my photo is the growing pile of materials that I and Nicholas Reyland made during our three days in the house in 2002. It contained conducting scores and folders of manuscript materials etc.. On the top we put a note to suggest that they should all go to the Paul Sacher Foundation in Basle to join the rich array of other items that Lutosławski had deposited there. I do not know if that was ever done; I hope so. 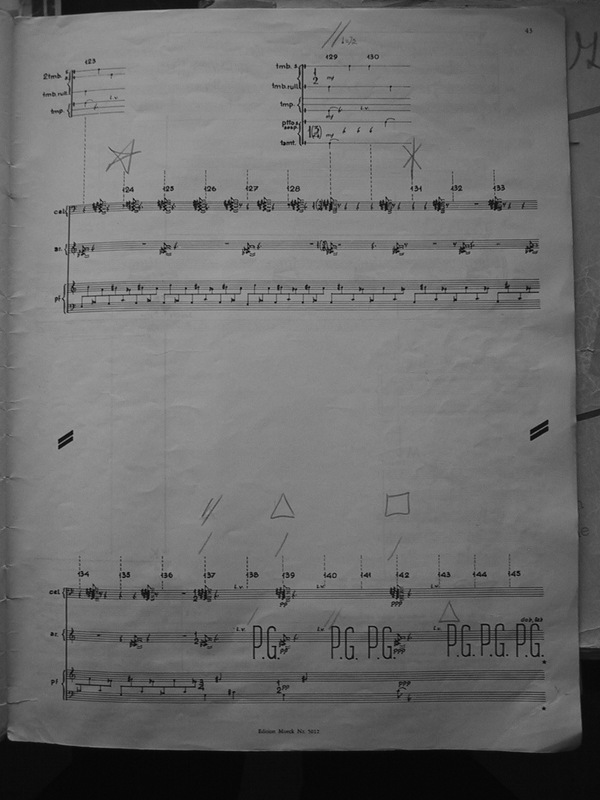 As a follow-up to yesterday’s post on the pitch designs for Jeux vénitiens (1960-61), here is Lutosławski’s complete conducting score. It is a bit tattered, especially the back pages. 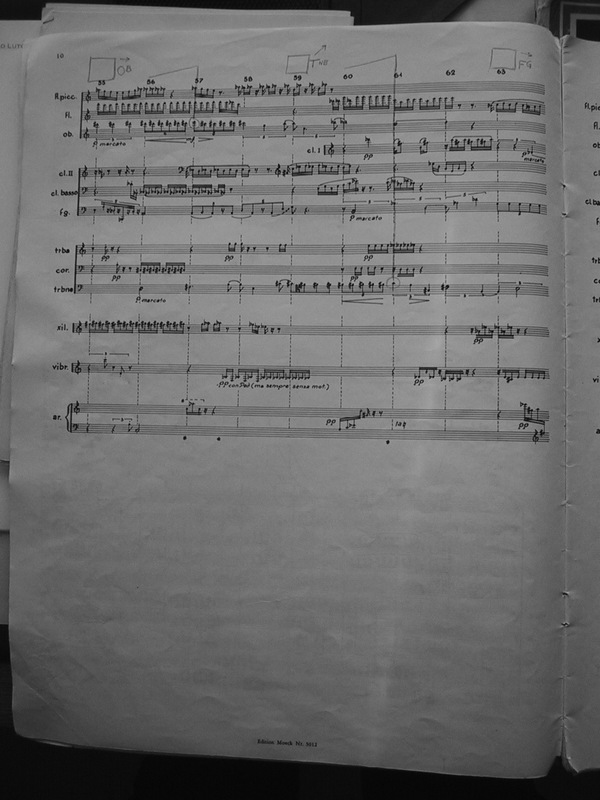 There was no indication of how long he had been using it, but it is quite possible that he marked it up for the first time that he conducted Jeux vénitiens, in Basle on 14 May 1968. 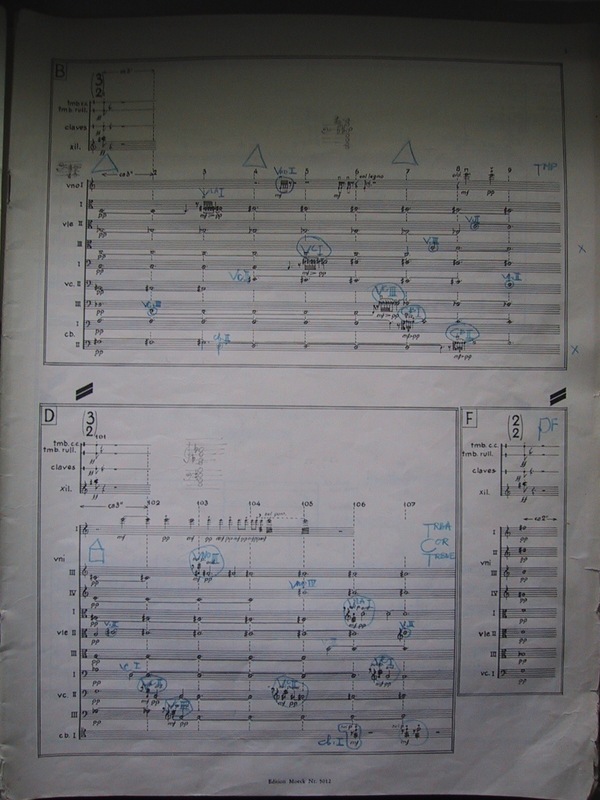 Lutosławski has tidily marked it up with conducting cues etc., some harmonic reminders in the first movement, rhythmic reductions in the second, timings and upbeats in the third, and sfpp sequences in the finale, and various other indications. 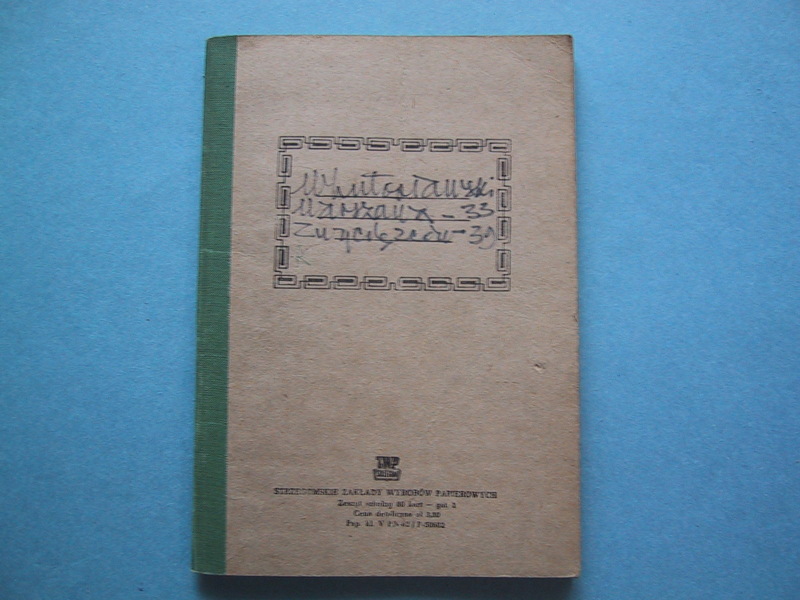 Jeux vénitiens was co-published by PWM in Poland and Moeck in (West) Germany. 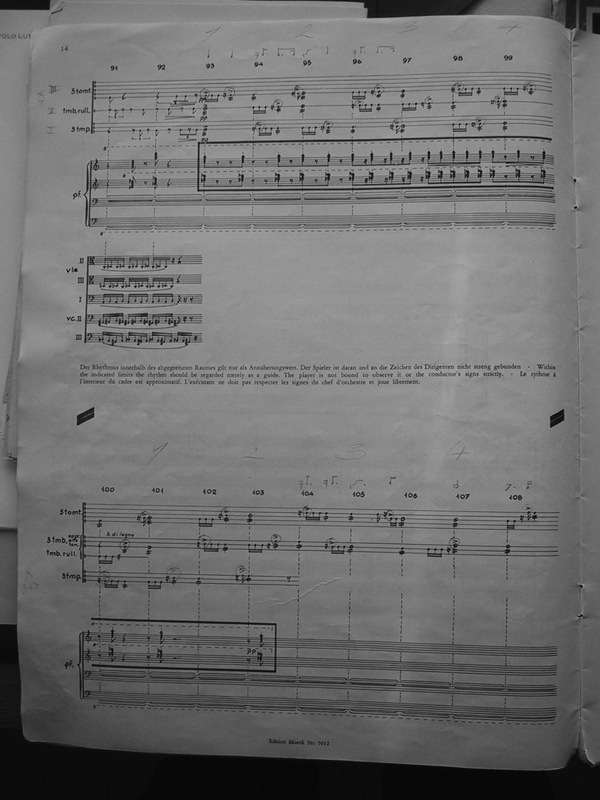 Lutosławski’s score was the Moeck imprint (large format, 40cm tall), published in 1962. 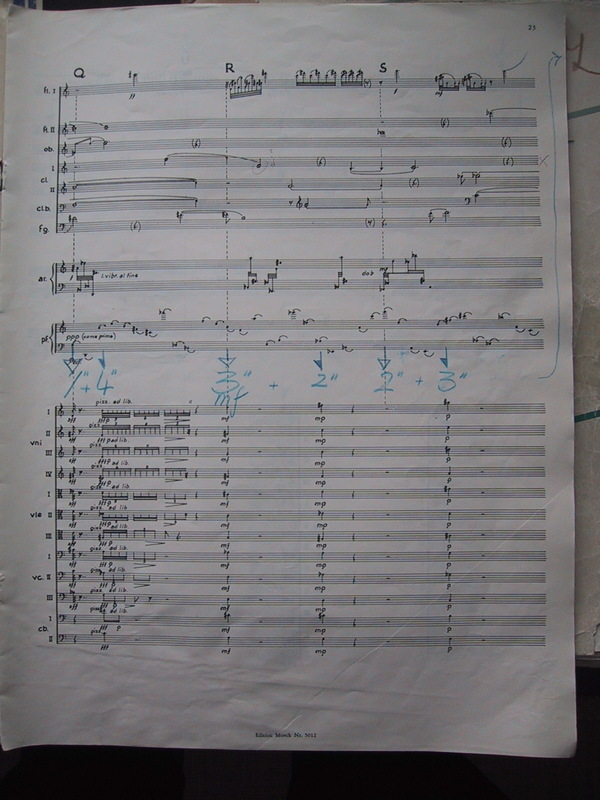 I don’t remember how many of his other conducting scores were still there in his study in September 2002. 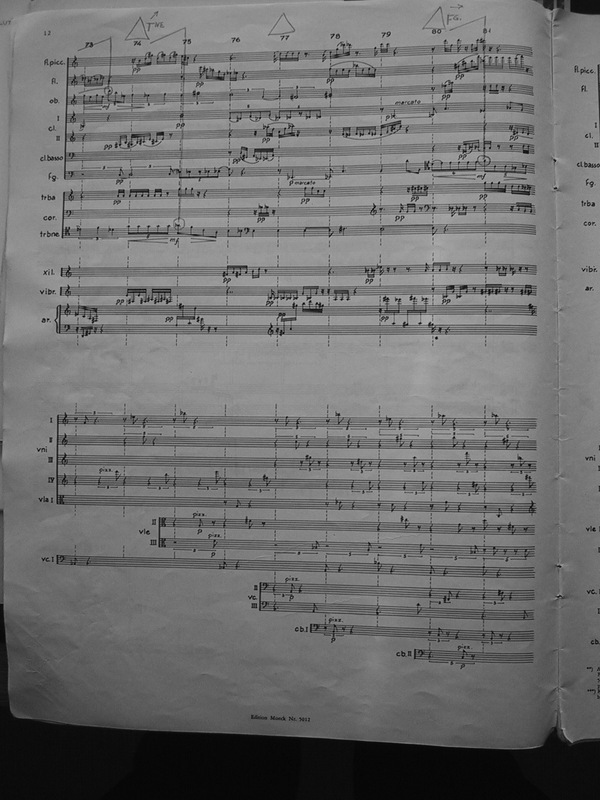 One that I did photograph, and to which I will return in due course, was of the Cello Concerto. 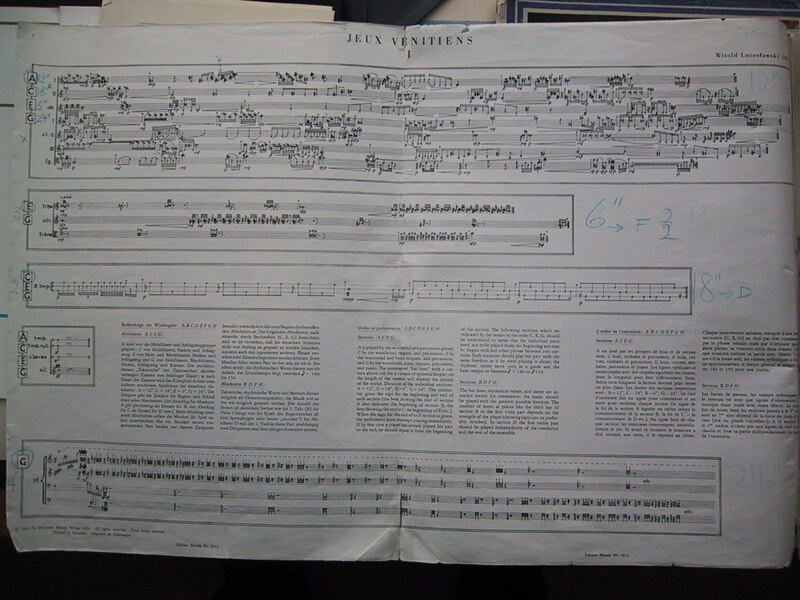 Meantime, here is the complete score of Jeux vénitiens, rather variably photographed (some are in black and white, although most show his blue-pencil markings), but I hope its 45 pages will be of some interest. 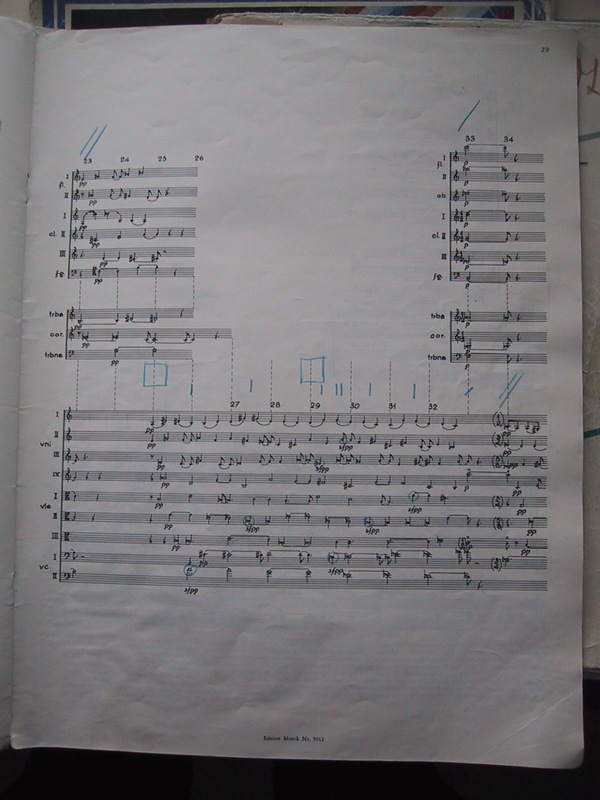 Among loose manuscript paper in Lutosawski’s study in September 2002 were three rather special sheets relating to Jeux vénitiens (1960-61). 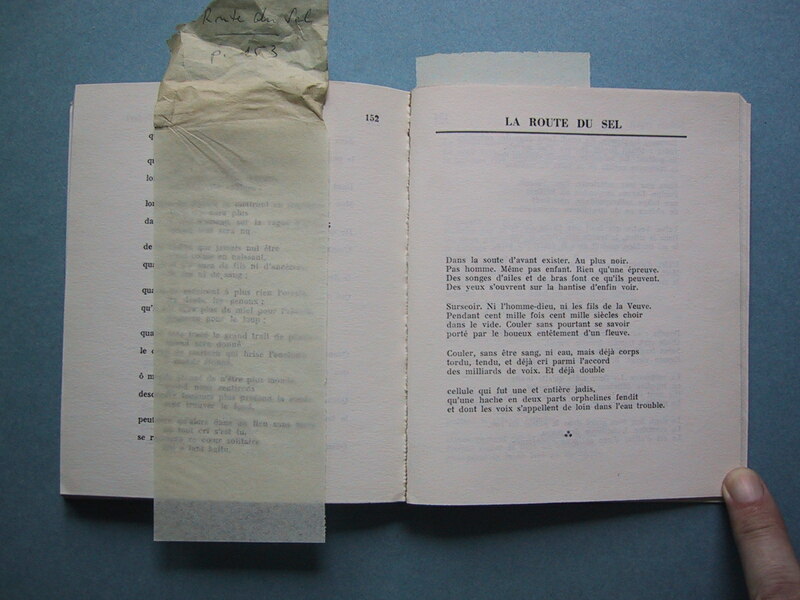 They are not preparatory material but rather a post-compositional aide-mémoire. And the fact that they are written on English and not Polish manuscript paper confirms this. Perhaps they were drawn out as preparation for a lecture to composition students. 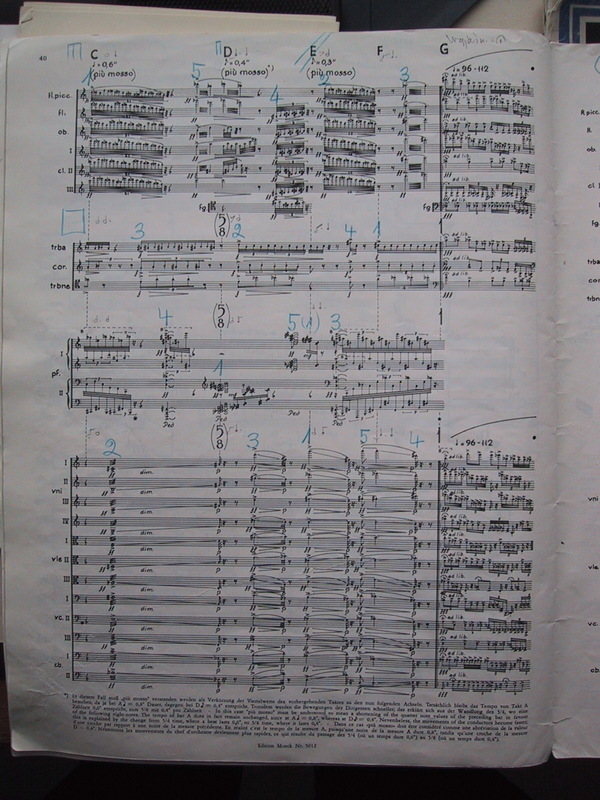 On these three sheets Lutosławski has outlined the harmonic trajectory of the four movements of Jeux vénitiens. You will hardly find a more succinct summary of his pitch designs for this key work. 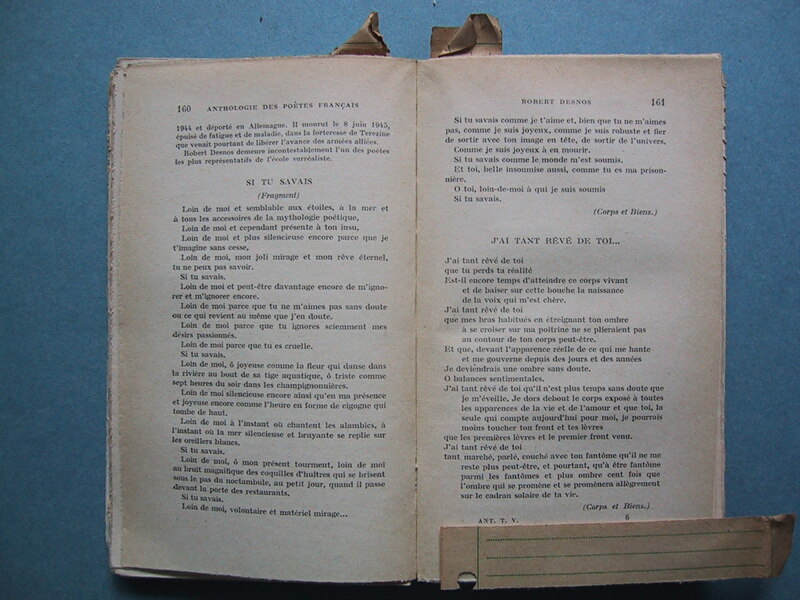 This contains material for the first and second movements. The harmonic framework of the first movement is well-known. 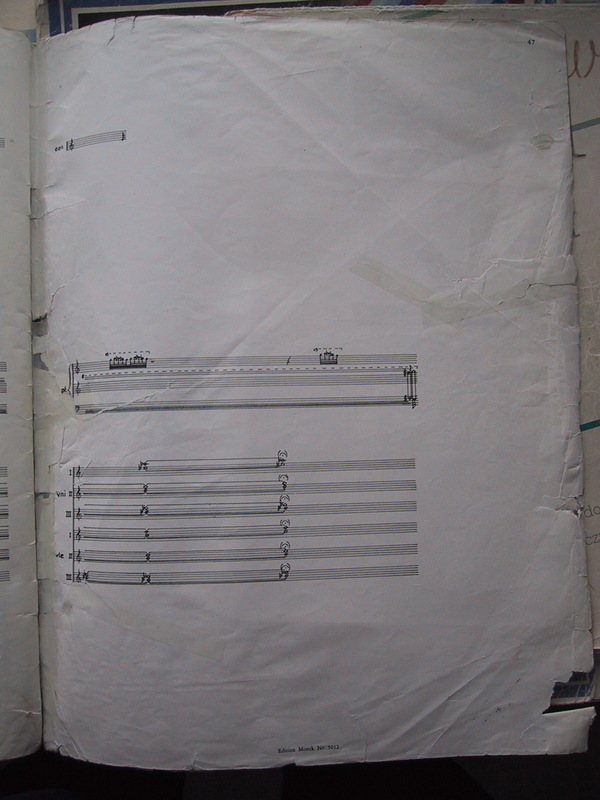 He gives here the pitch structures for the components that are introduced successively in sections A, E and G; there is nothing for C as that is for (unpitched) timpani. He then gives the harmonic progressions underlying sections B D F and H.
The second movement is less straightforward. 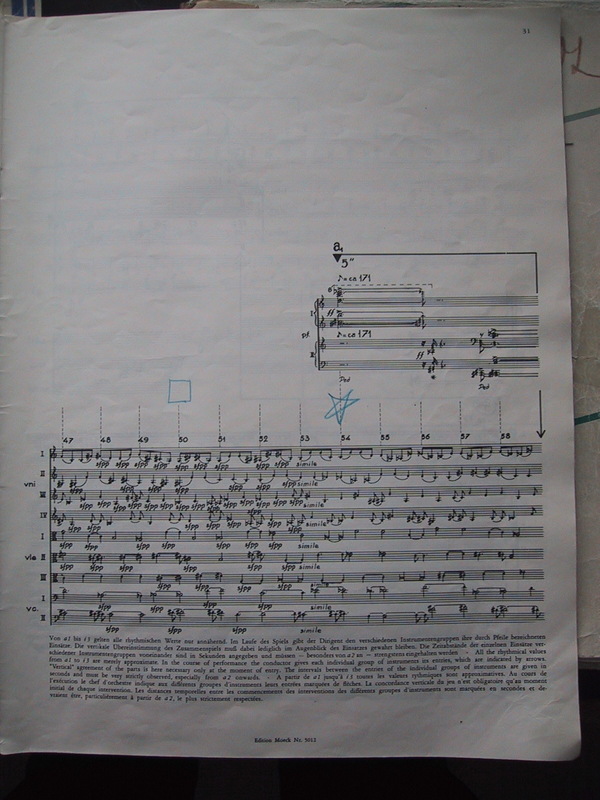 First, Lutosławski ignores the opening 29 bars, starting his notation at the moment when the strings stop playing and pursuing it to the end of b.36, just before the strings re-enter. 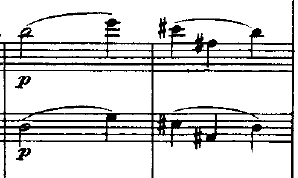 Secondly, he jumps to the next non-string section, bb.55-68. 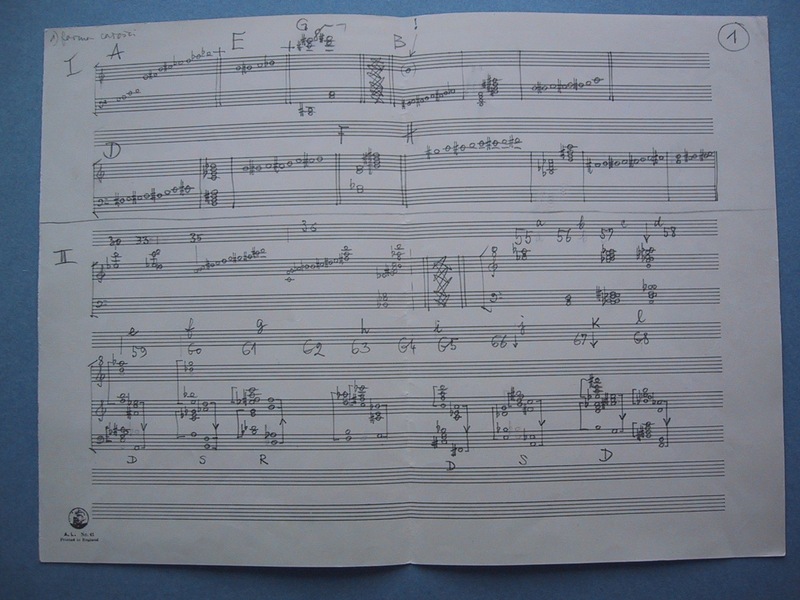 What is especially revealing here is that the changing chords are not fully represented in the score. Instead, they serve as wells from which Lutosławski draws his droplets of sound in woodwind, brass, xylophone, vibraphone and harp. 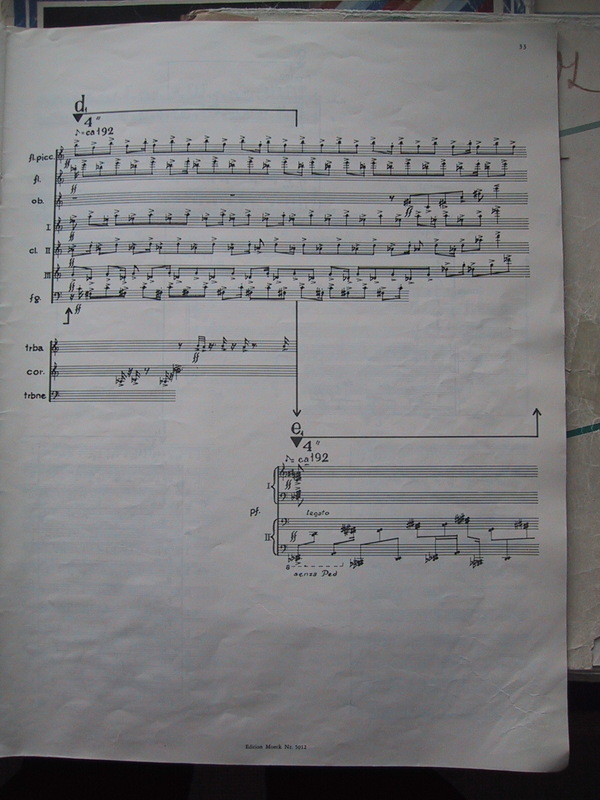 Although this movement is often regarded as the most conventional of the four, this was a technique that he used on many occasions as it maintained the notion of twelve-note harmony while giving the texture air and a sense of intangibility. The rest of the movement is absent from this summary. Under six of the chords between b.59 and b.67 are some capital letters. 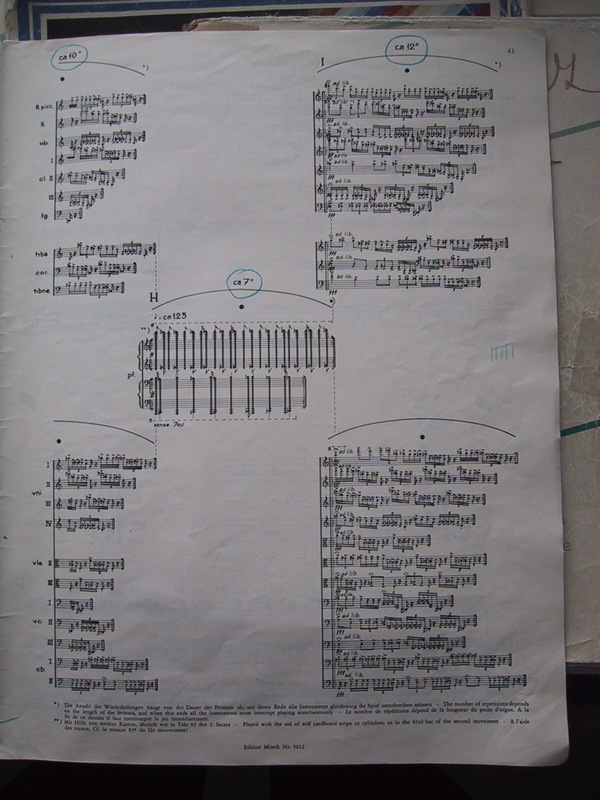 These were Lutosławski’s private code. He thought of certain types of chord, with characteristic intervallic constructions, as reminding him of some of his favourite twentieth-century composers. Elsewhere, for example, ‘P’ refers to Panufnik and ‘Ro’ to Roussel. Here there are D, R and S. I leave you to divine which composers are represented by these initials. 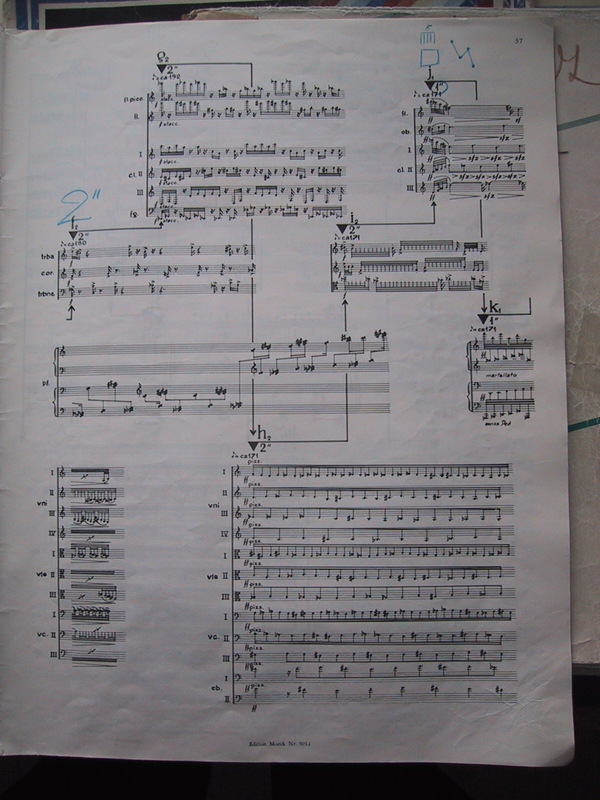 Sheet 2 is devoted entirely to the third movement of Jeux vénitiens. 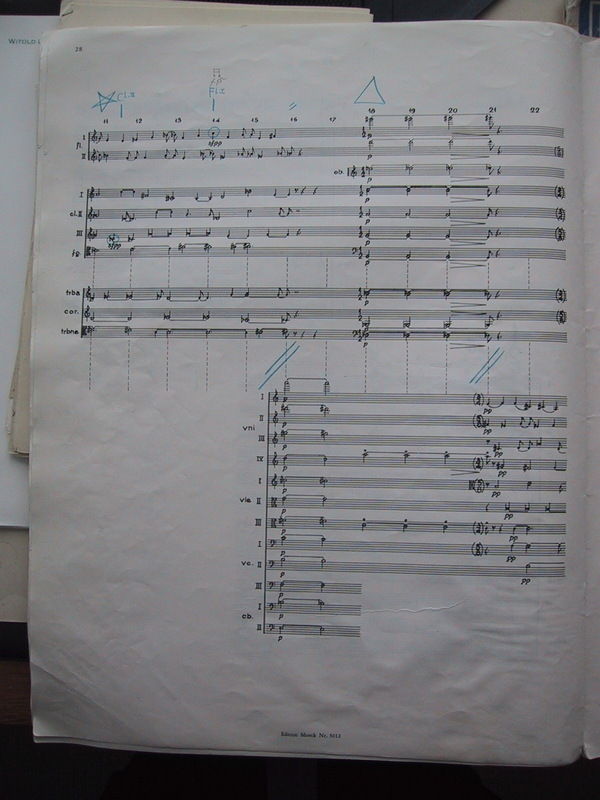 This was composed after the premiere of the other three movements in Venice (24 April 1961); the revised work was premiered in Warsaw later that year (16 September). 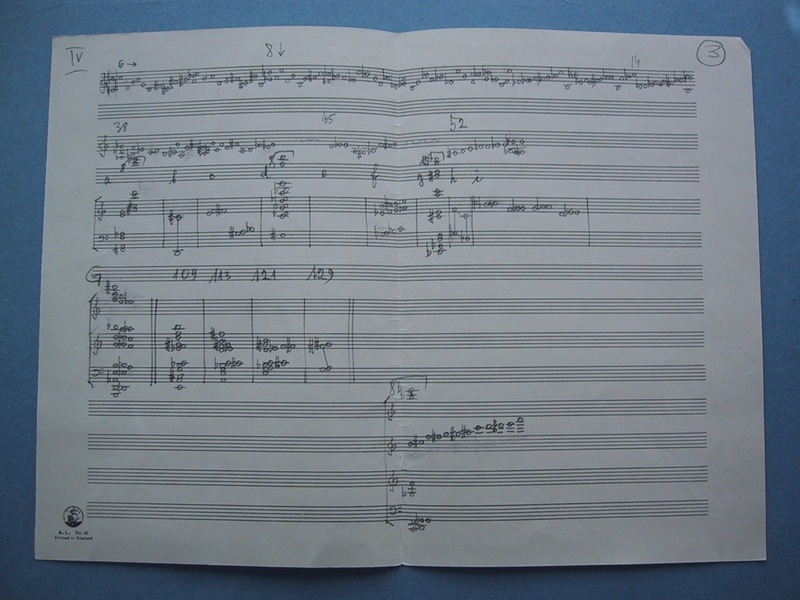 The concept of this new movement is to take the motivic cells from the woodwind in component A of the first movement, where they are treated harmonically, and unravel them gradually as a melodic line for solo flute. This line is absent from Sheet 2. 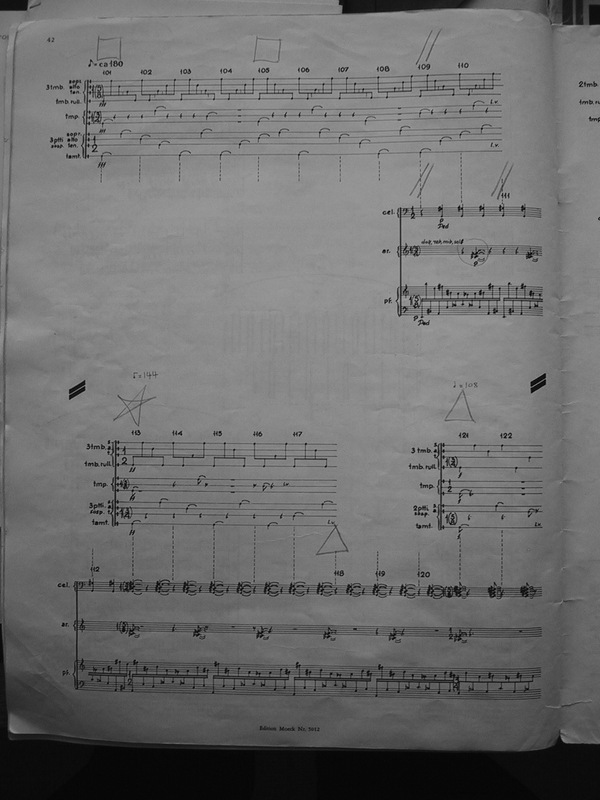 Instead, Lutosławski follows the two interlocking orchestral strands: (i) the developing continuum in woodwind, harp and piano (A to W) and (ii), where ‘strings’ is written above the third system, the string chords that punctuate the sustained texture between letters D and W. As can be seen in each of these strands, Lutosławski contracts and expands them, using the changing vertical space as an integral expressive device. The string chords, for example, unfold outwards from the dense twelve-note clusters of L-P, but they reach their fully opened position not at the end of the movement but as the first chord of the fourth movement, as indicated here. 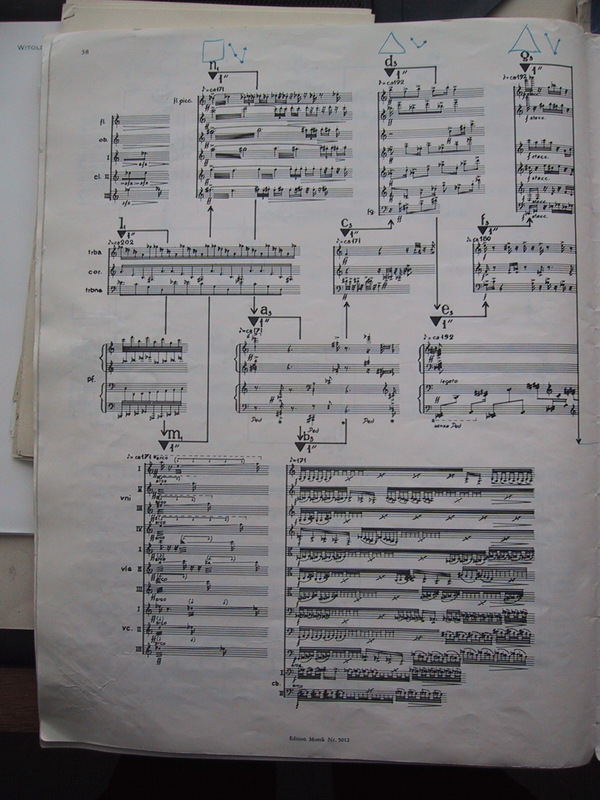 As with the material given for the second movement, this third sheet is also selective in what it contains from the fourth movement. 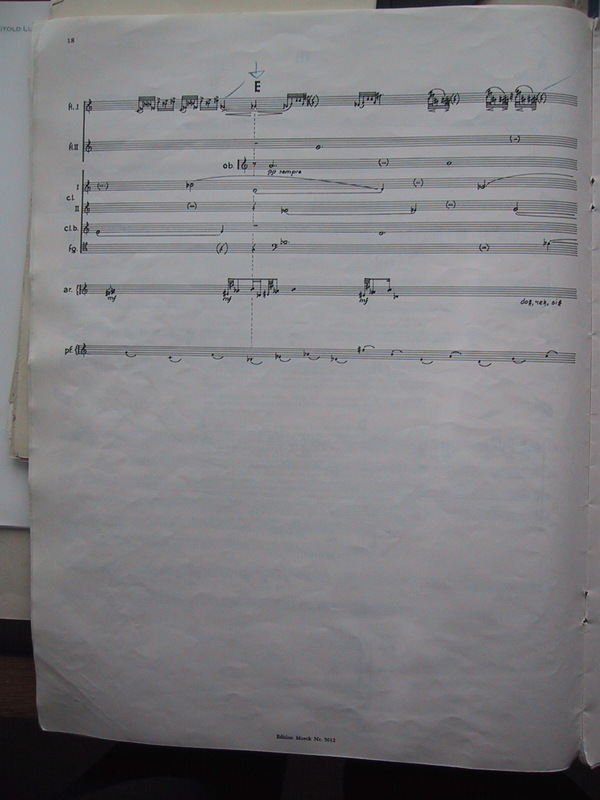 The top line (bb.6-14) intriguingly gives a linear presentation of what in the score seems to be more of a shifting harmonic sequence in the wind. Pitch-rotational techniques seem to be in operation. There is no reference to the sfpp accent that first appears in b.10. 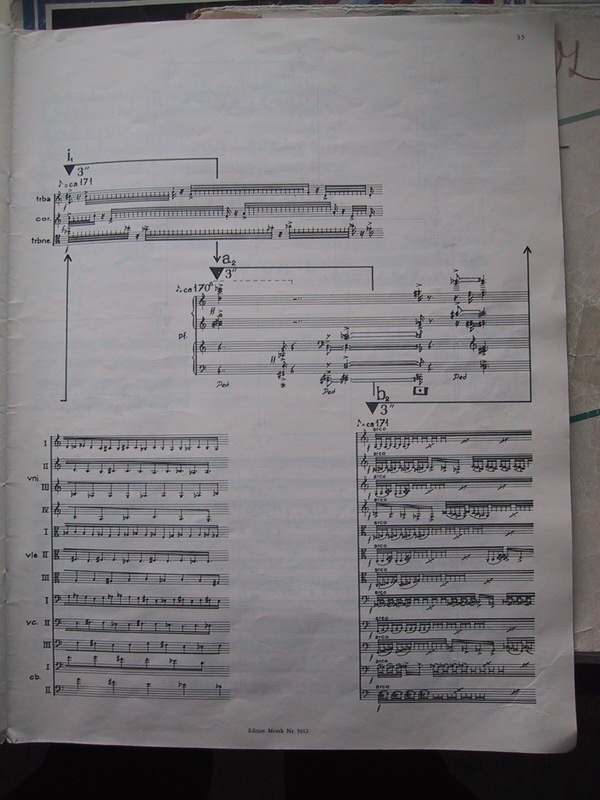 The second system does something similar for the string passage that begins in b.38 and goes as far as the introduction of the first objet sonore (‘a’) of the nine that will lead cumulatively to the movement’s climax. 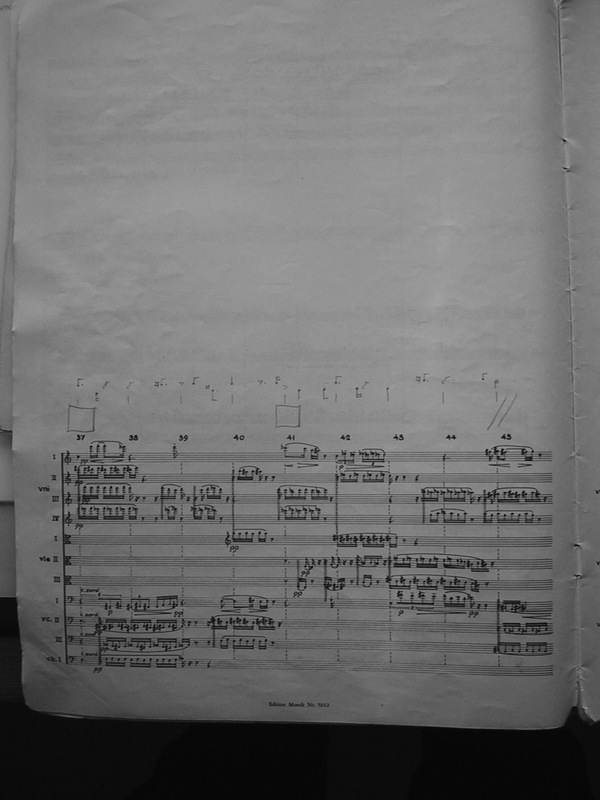 For some reason Lutosławski has not included the pitch material for the piano for ‘e’. 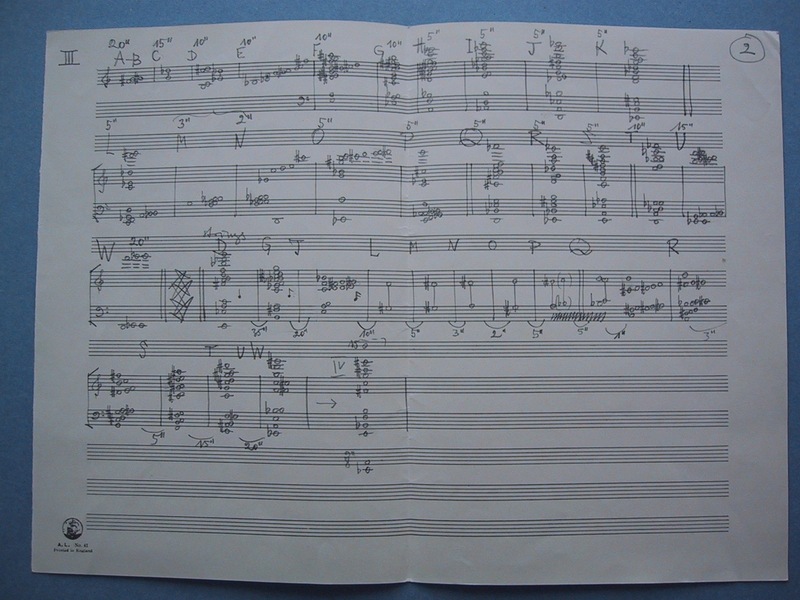 He then jumps to the climactic chord at letter G, followed by the contracting harmonic span (celesta, harp and piano) that leads to letter J at the end of b.145. 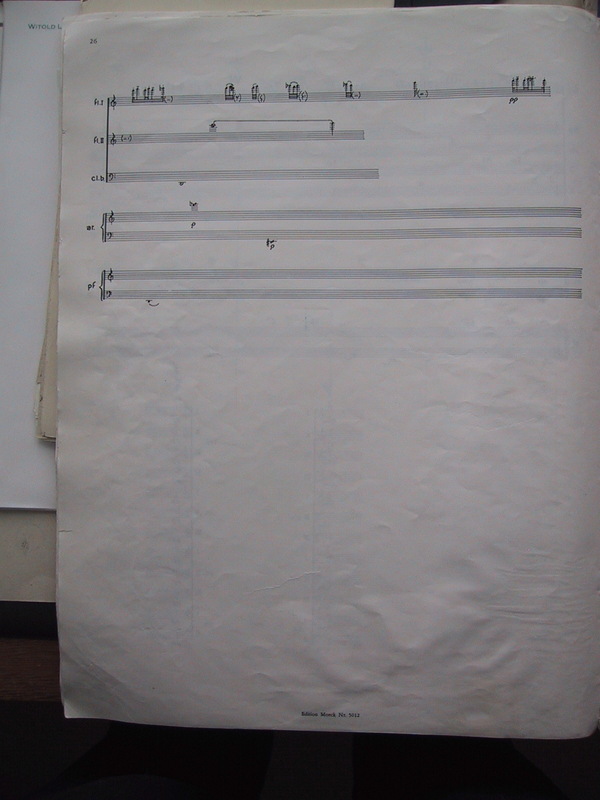 The unlabelled, four-stave chord that concludes this sheet refers to the passages leading to and away from letter M. Reading up from the bottom: cellos and basses, vibraphone and brass, celesta and piano, and violin and viola harmonics. The harp cluster and dying embers of the flutes are not included. There are several other posts on this site concerning Jeux vénitiens. To find them, simply type ‘Jeux’ or ‘Jeux vénitiens’ into the blank (search) box in the header on the top right of any page and press ‘GO’. 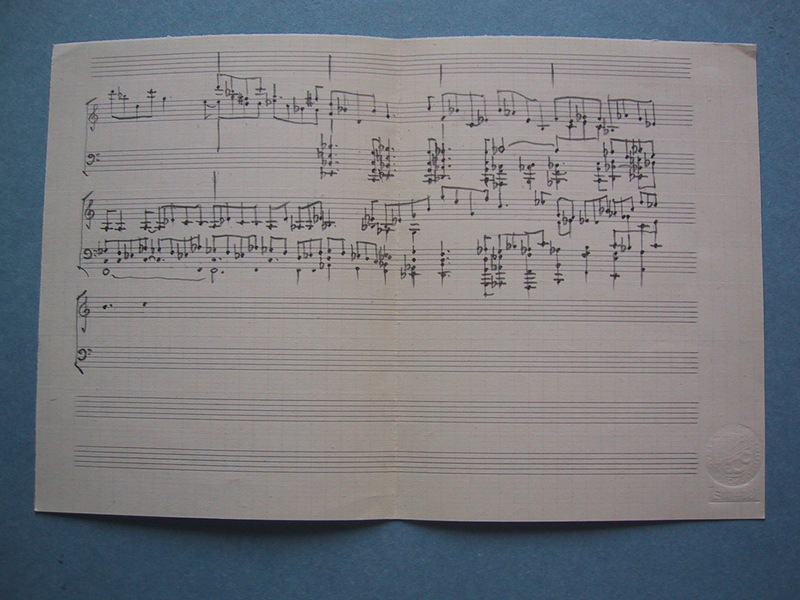 Lutosławski was in the habit of marking pages in his books with bookmarks and/or underlining of titles and key passages. 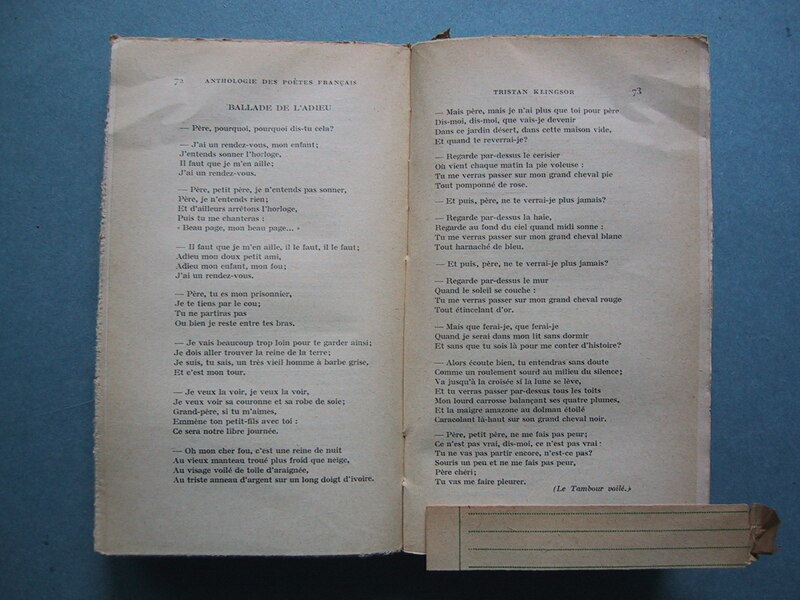 One such book was La poésie surréaliste, where he bookmarked poems by Desnos (‘Les Espaces du sommeil’), Ivšić (‘Météores’), Mansour, De Massot (‘De tout repos’) and Paz (‘Pierre de soleil’/’Piedra de sol’). 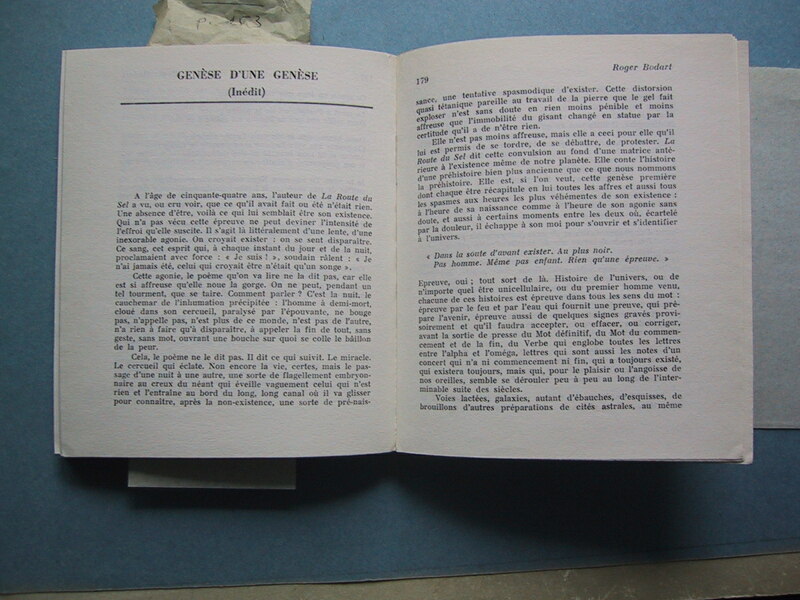 It is interesting to note, in the case of the first two items, that Lutosławski cannot have received or bought these copies until after he had decided to use the poetry of Henri Michaux (Trois poèmes, 1963) and Jean-François Chabrun (Paroles tissées, 1965). 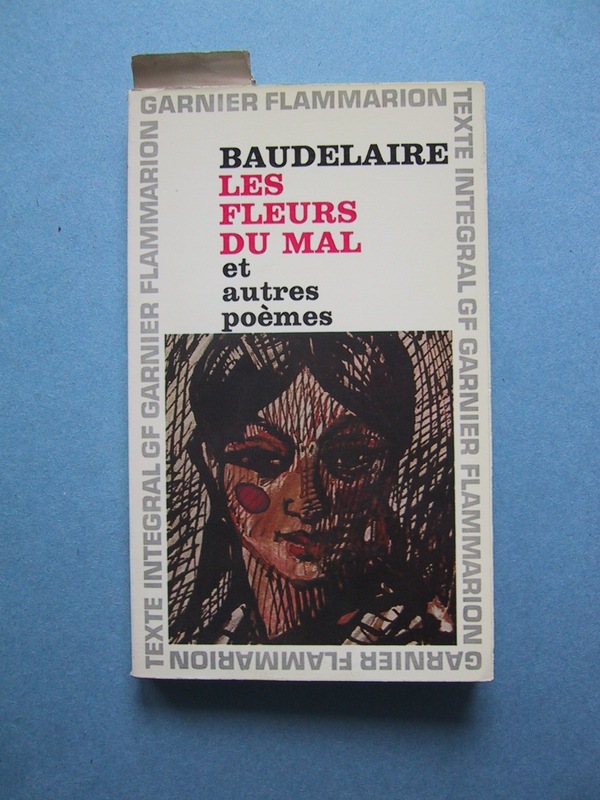 These were the five poems (not in this order) that Debussy set in his Cinq poèmes de Baudelaire, so it is reasonable to assume that this was why Lutosławski marked them and not because he intended to use them himself. There were no further annotations. 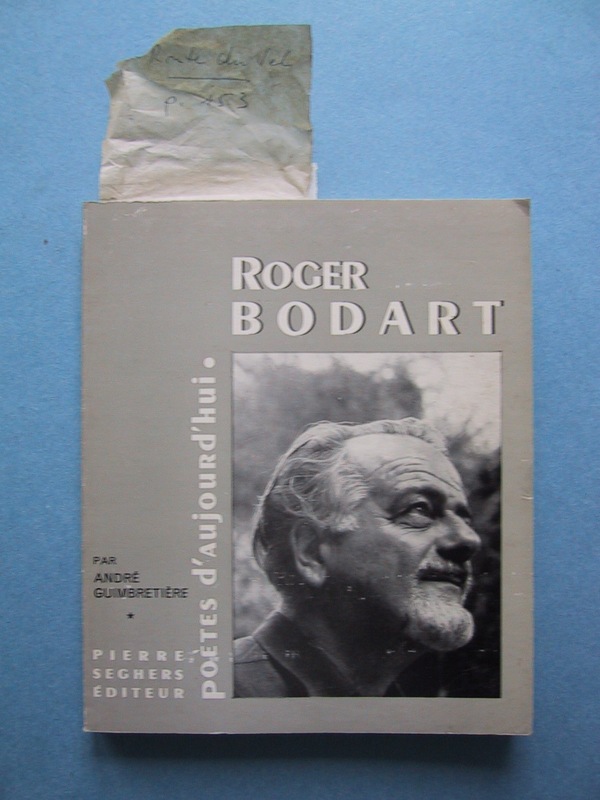 Cette remise en question devient impitoyable dans La Route du sel (1964), l’ouvrage majeur de Roger Bodart. En termes haletants et abrupts, le poète y décrit une aventure exceptionnelle, un univers abyssal, secoué par un terrible séisme qui reflète, de toute évidence, le péril atomique, les pires angoisses de notre temps, mais aussi d’une autre manière, l’histoire d’une préhistoire bien plus ancienne que celle de la préhistoire. D’emblée, Bodart nous introduit au cœur d’une entreprise singulière, difficile à définir, dans la mesure où celle-ci est porteuse de significations multiples. La Route du sel est une de ces œuvres particulièrement riches que l’on peut lire à plusieurs niveaux. Une métamorphose nous est décrite qui peut être identifiée à la genèse du monde, à la mort et à la renaissance d’un homme ainsi qu’à la création d’un poème. Itinéraire initiatique, démarche marginale, rigoureusement individuelle, La Route du sel témoigne d’une implacable expérience intérieure qui, dans son subjectivisme extrême, rejoint pourtant l’universel. 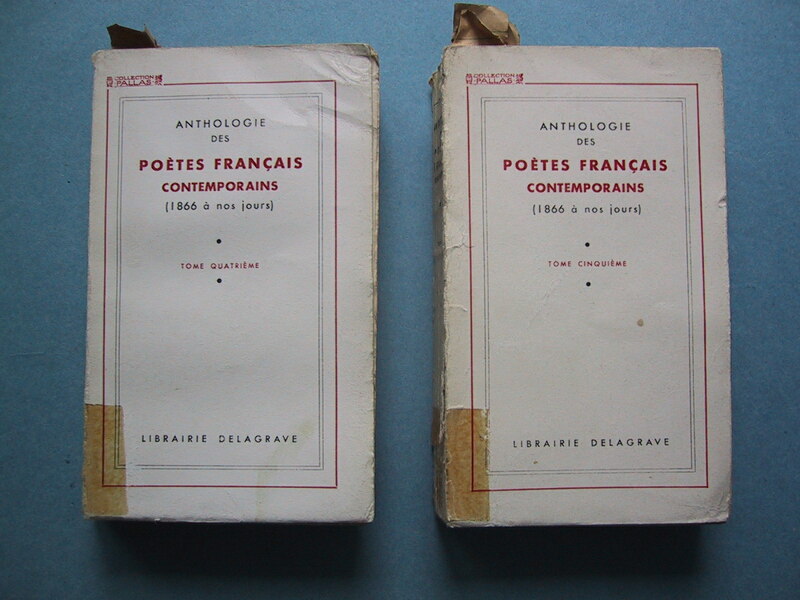 The two volumes of this series devoted to French poetry since 1866 had six page markers but no writing of any kind. 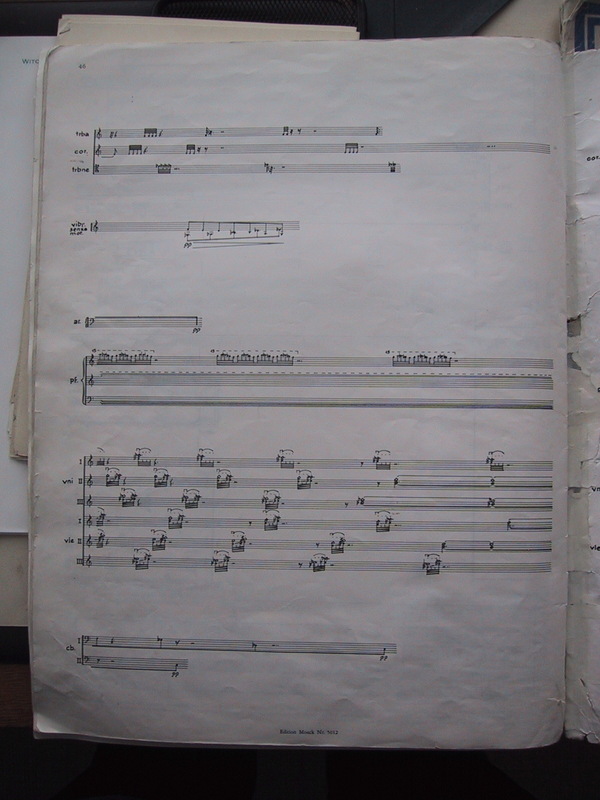 Given the presence of Desnos, it may be reasonable to speculate that Lutosławski perused these volumes in the years preceding the evolution of Les Espaces du sommeil. Several of these authors remain little-known. 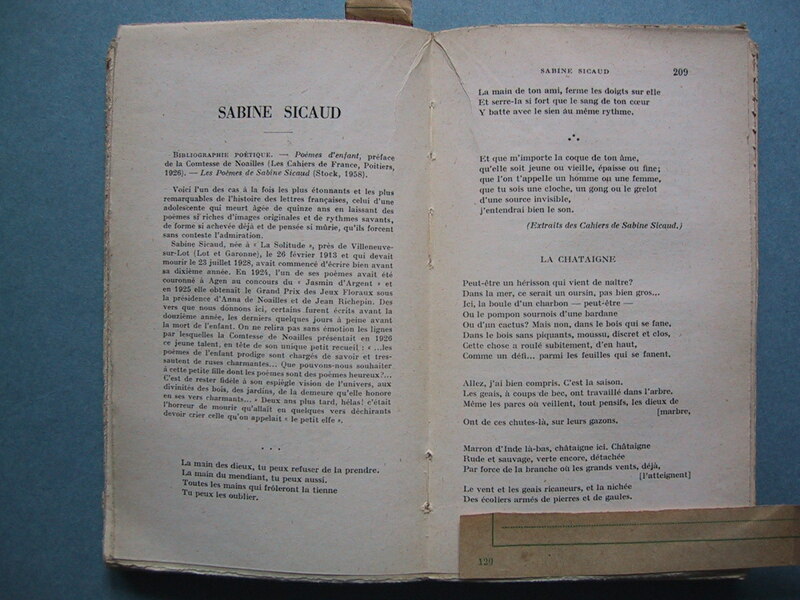 The most poignant of them is the last, Sabine Sicaud, who died aged just fifteen and a half. I have deliberately made little or no comment on the poetry or why it may have attracted attention. Happy reading! 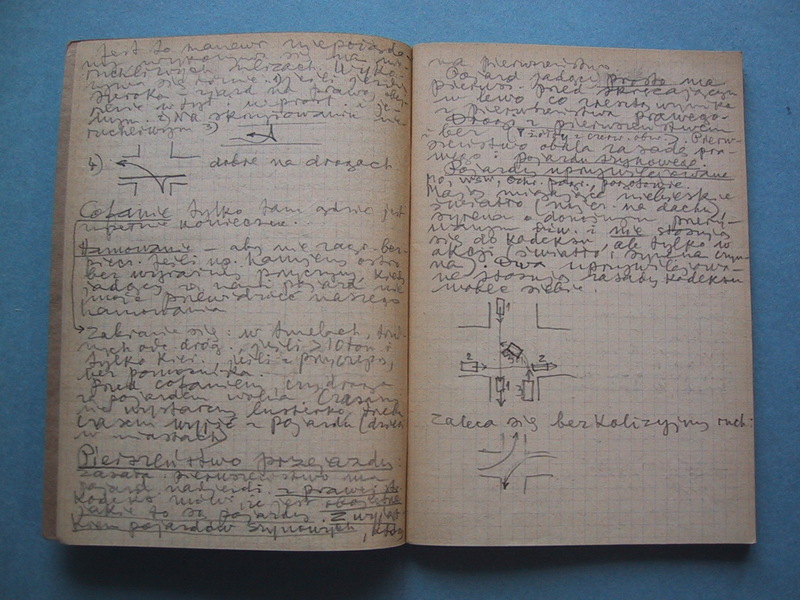 The most unexpected volume on Lutosławski’s bookshelves was an undated notebook with a green binding. 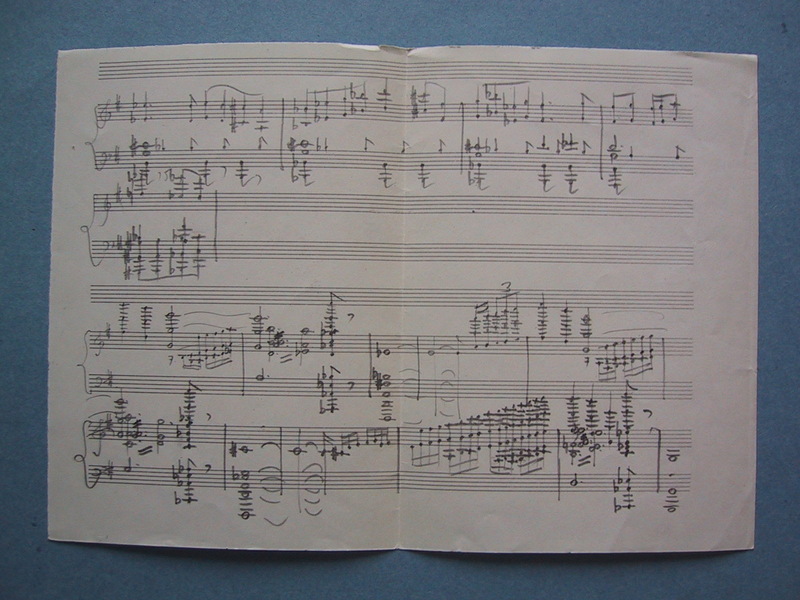 On the cover he had written: W Lutosławski, Warszawa – 33, Zwycięzców – 39. Lutosławski lived with his family in a flat at 39 Ulica Zwycięzców (Street of the Victors) from 1946-68. The ’33’ seems to relate to the district’s Post Office (there are now offices closer to his old flat). Apologies for the out-of-focus shot of the cover. When I opened the notebook I was surprised to find its pages filled with notes about how to drive. I took just a single further photo, of one of the early double pages, mainly because it included his diagrams of how to do three-point turns and how to navigate junctions. Evidently, preparation was the key for everything in Lutosławski’s life! It is also possible that the notes were written not for himself but for someone else in his family.